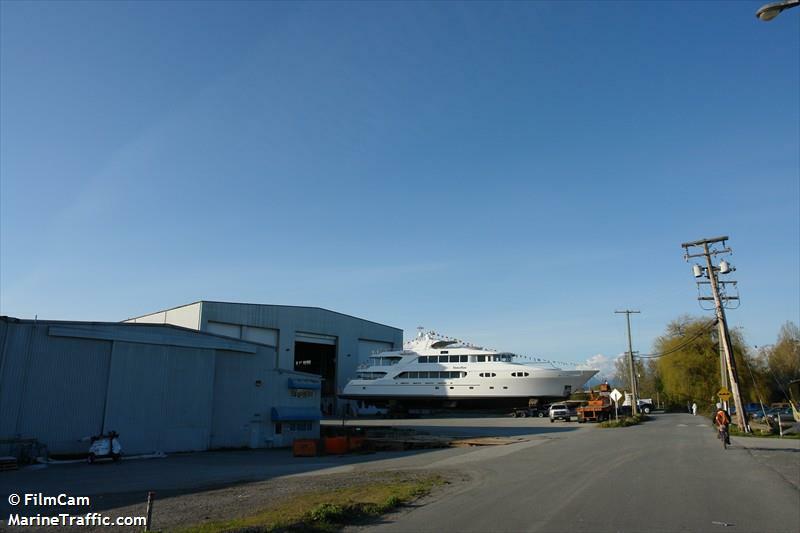 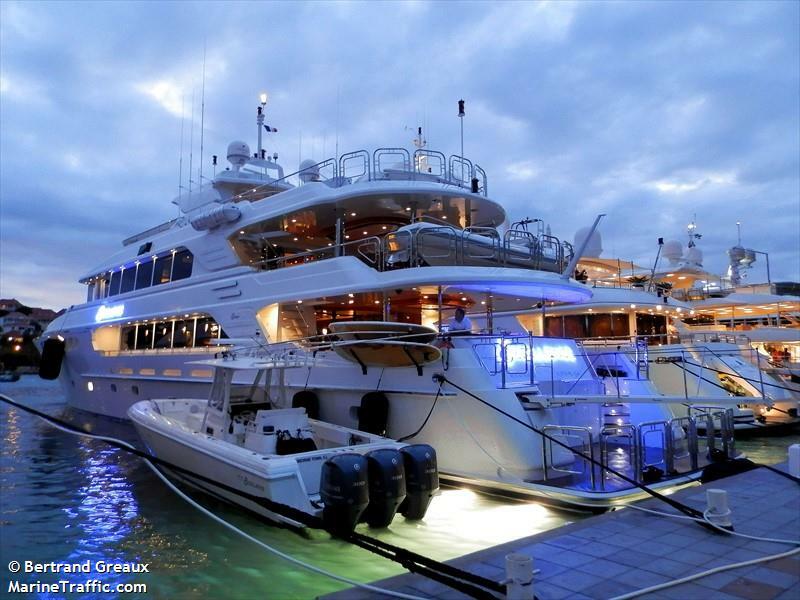 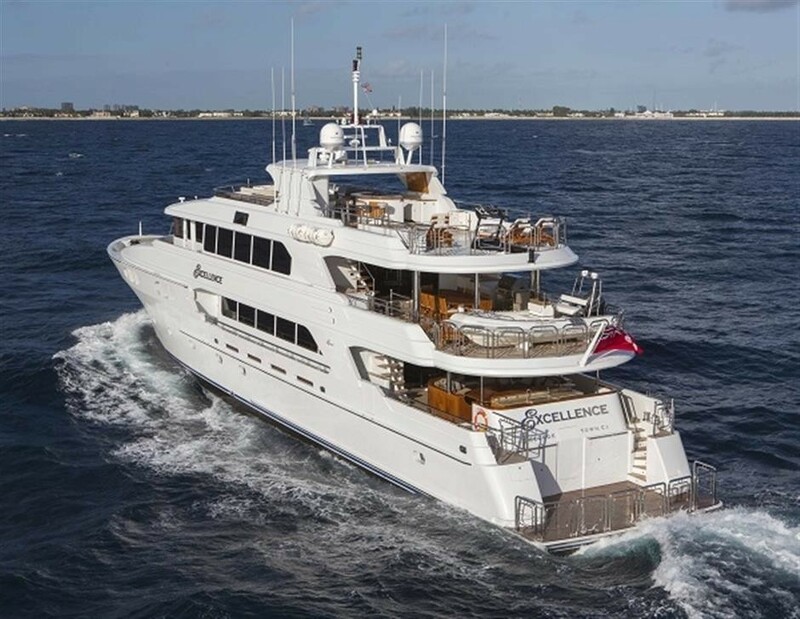 Luxury superyacht EXCELLENCE was designed by naval architect Setzer Group and built by Richmond yachts of Canada in 2010. 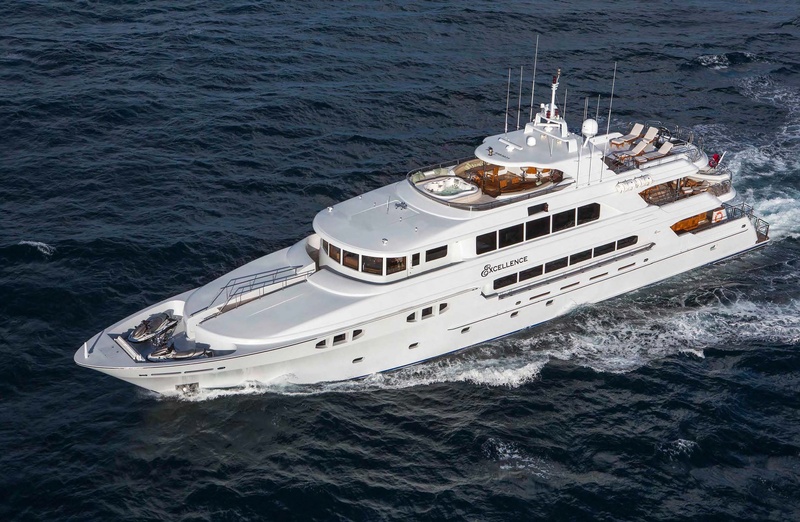 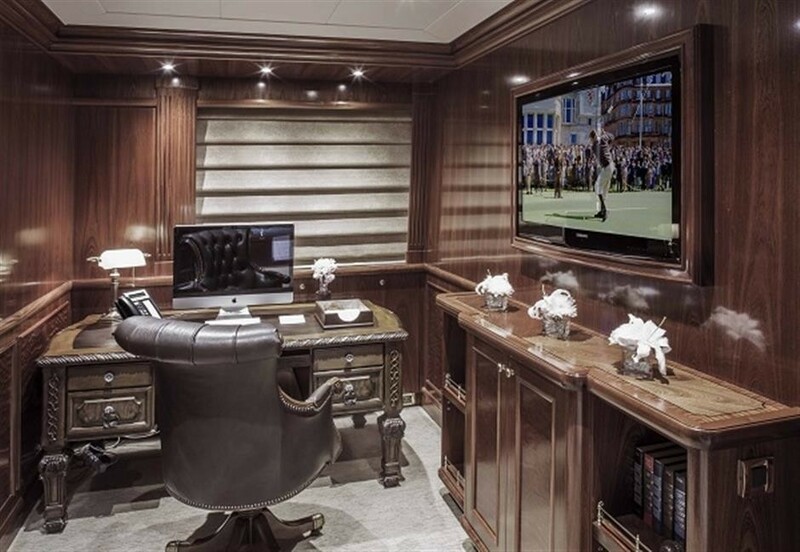 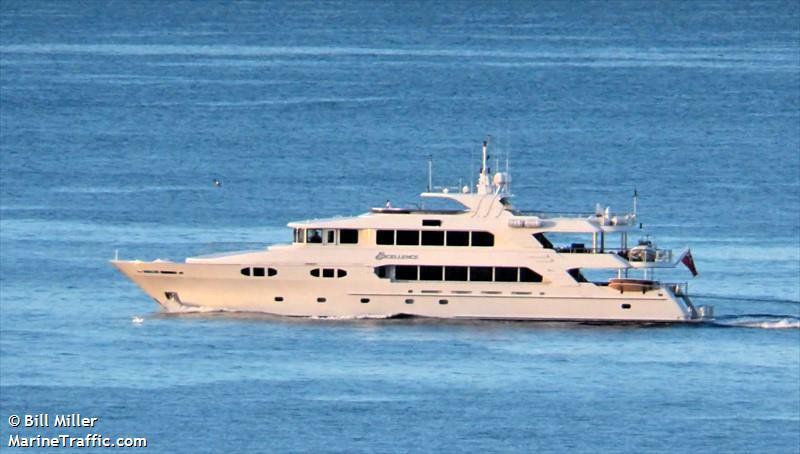 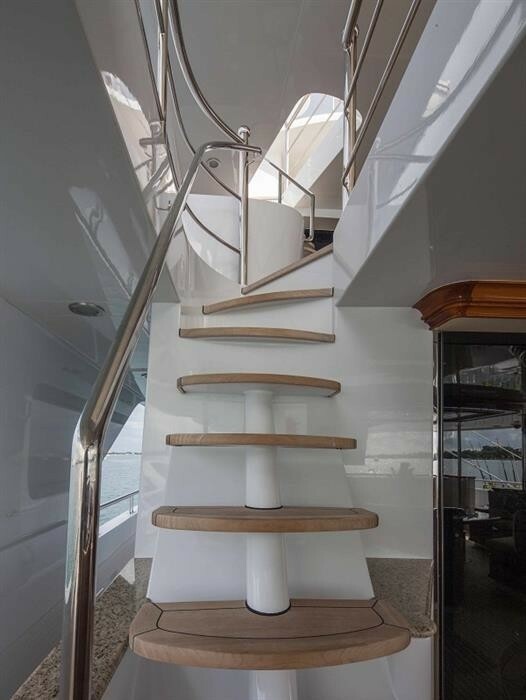 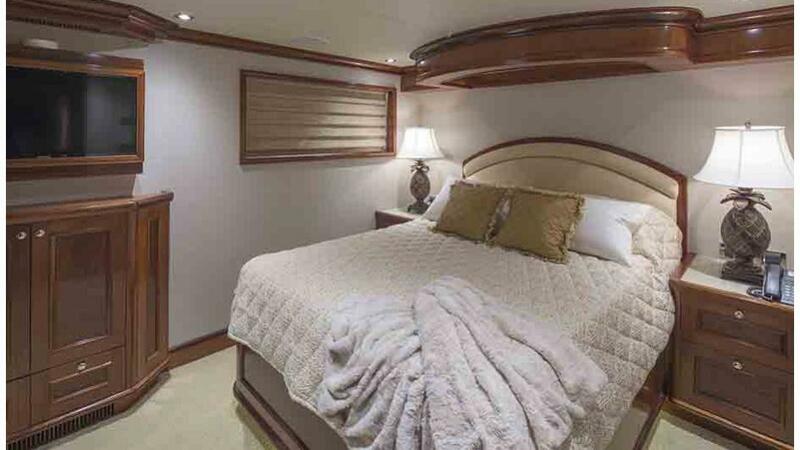 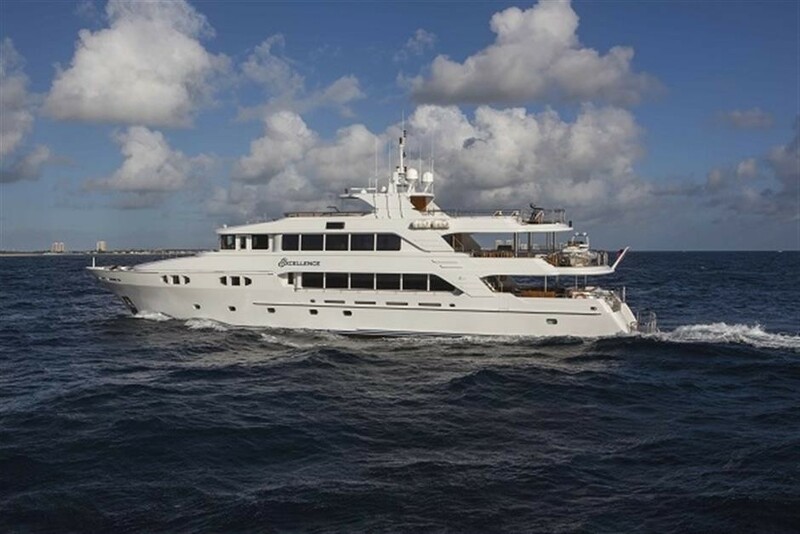 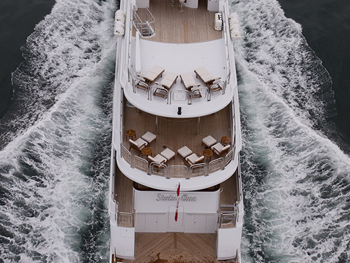 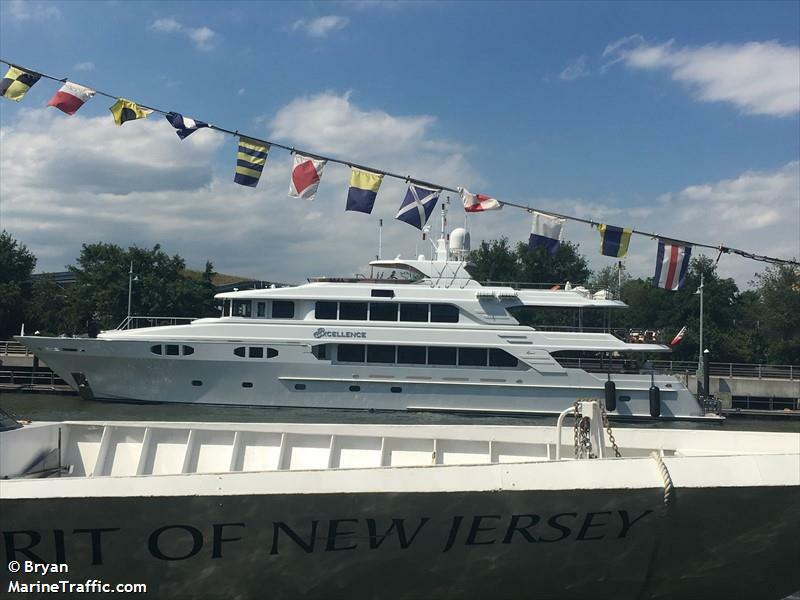 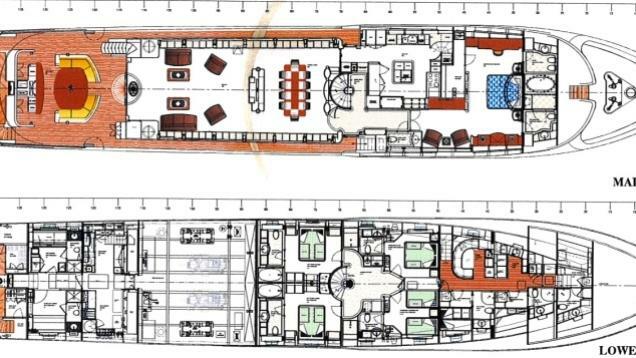 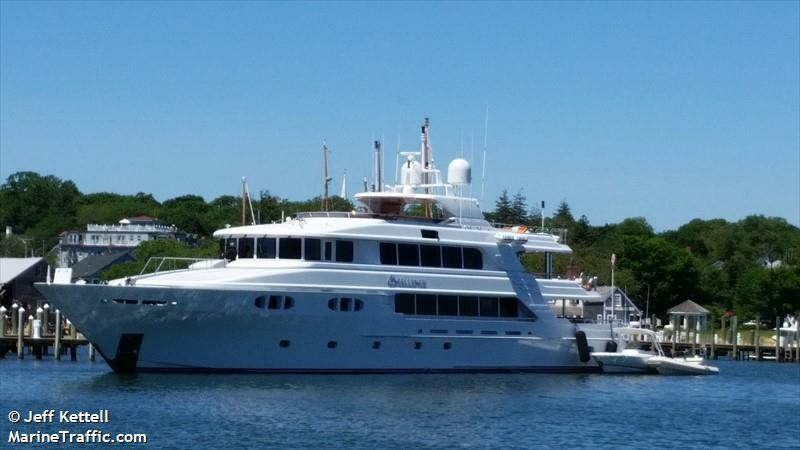 In 2013, the 45.7m (150ft) tri-deck crewed charter yacht received an extensive refit to include all new soft furnishings. 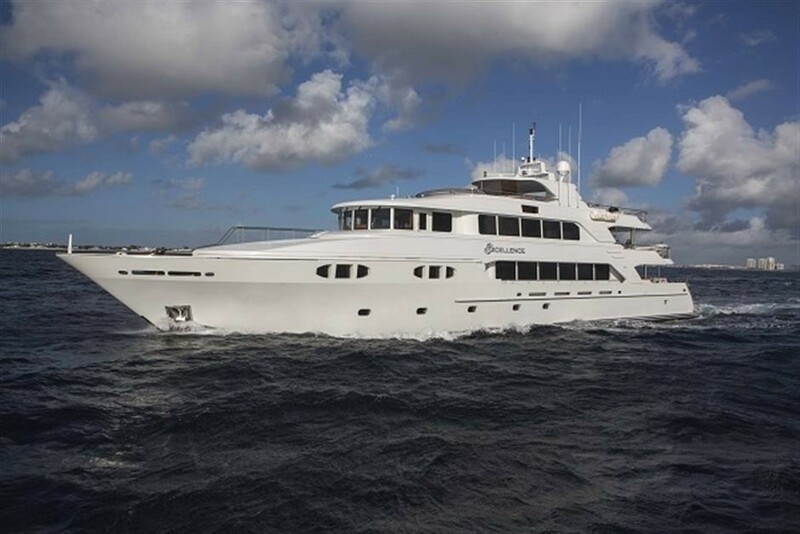 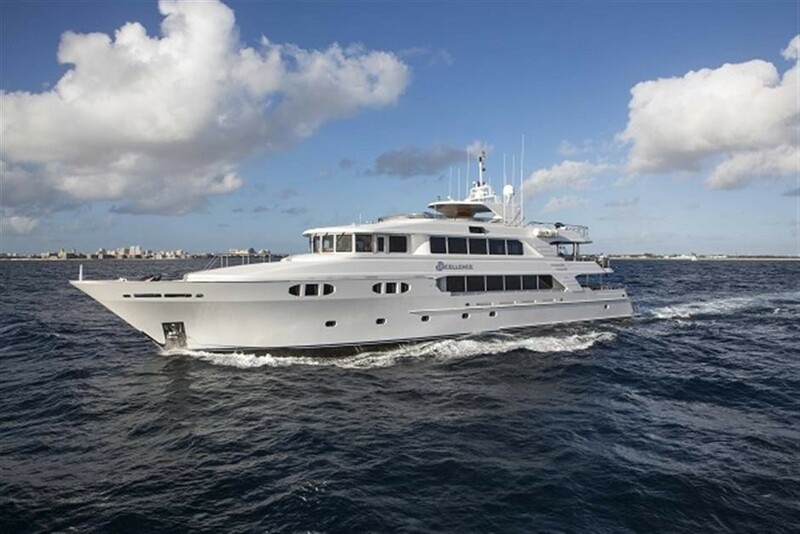 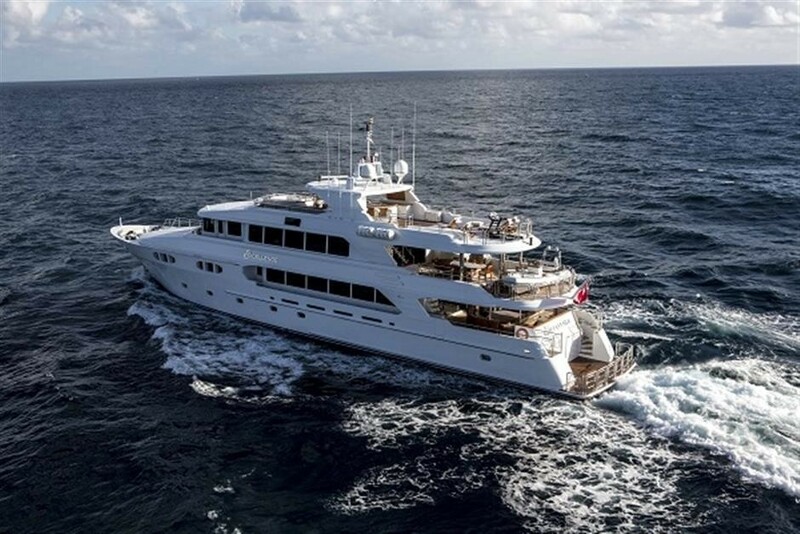 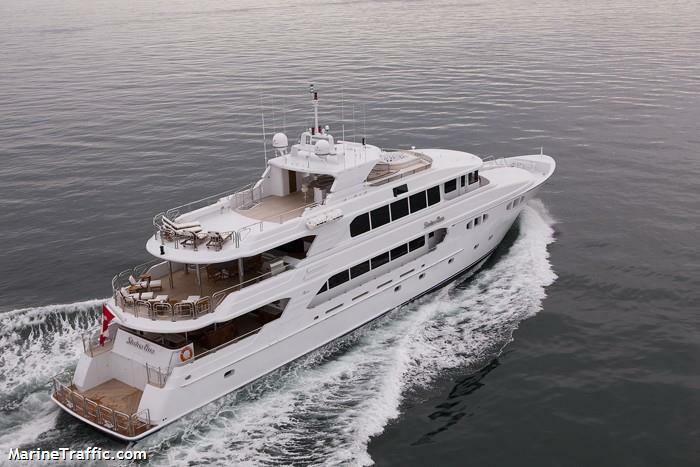 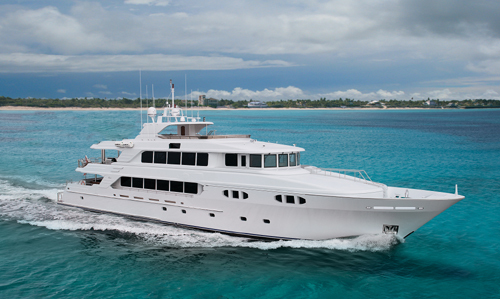 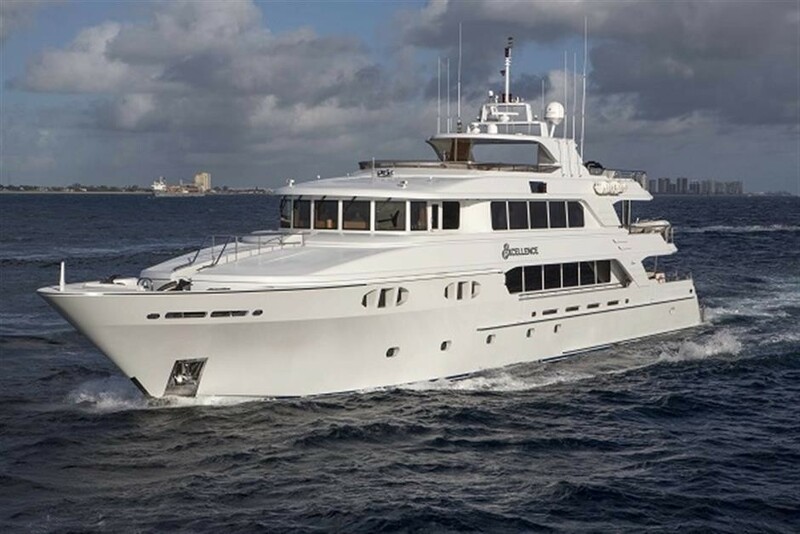 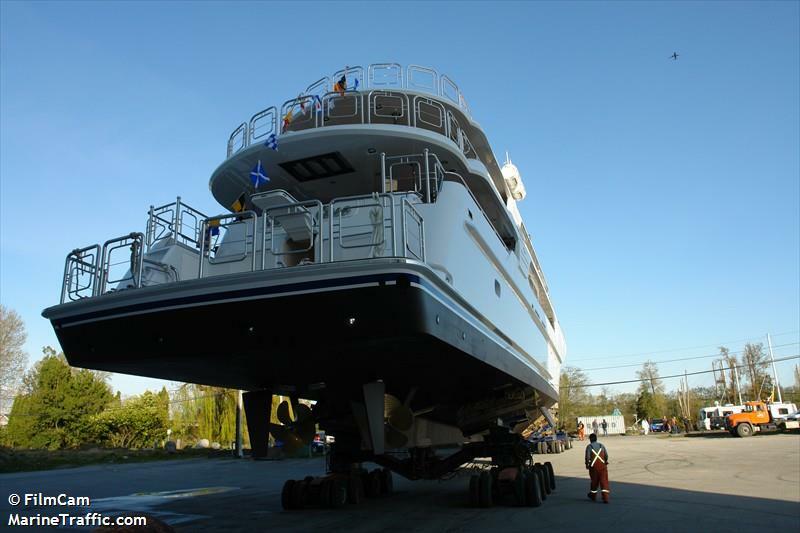 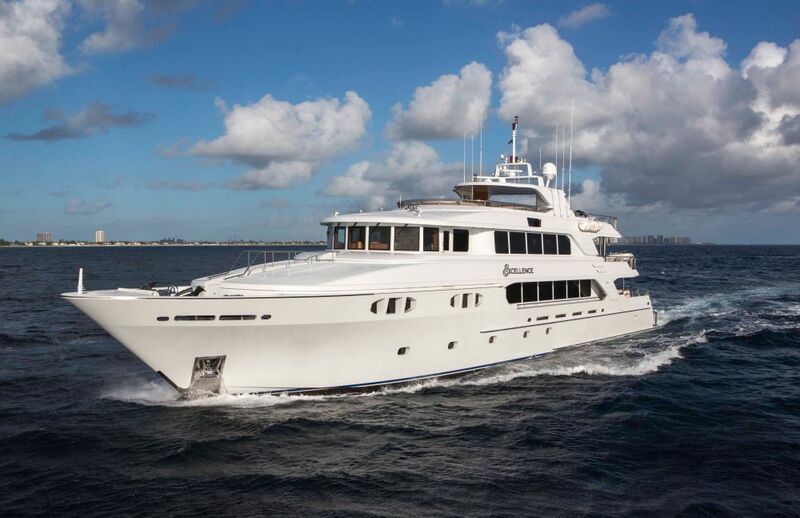 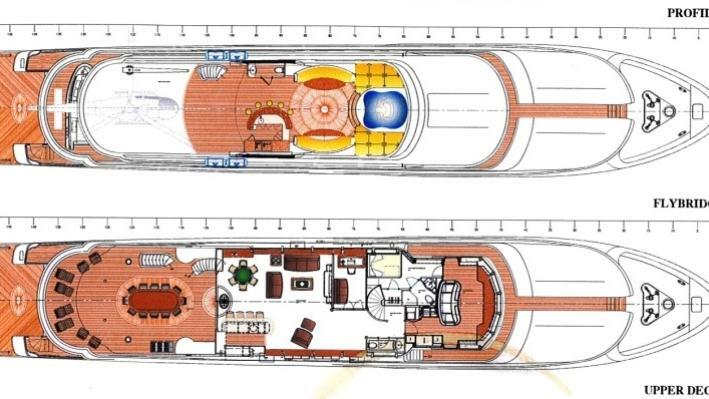 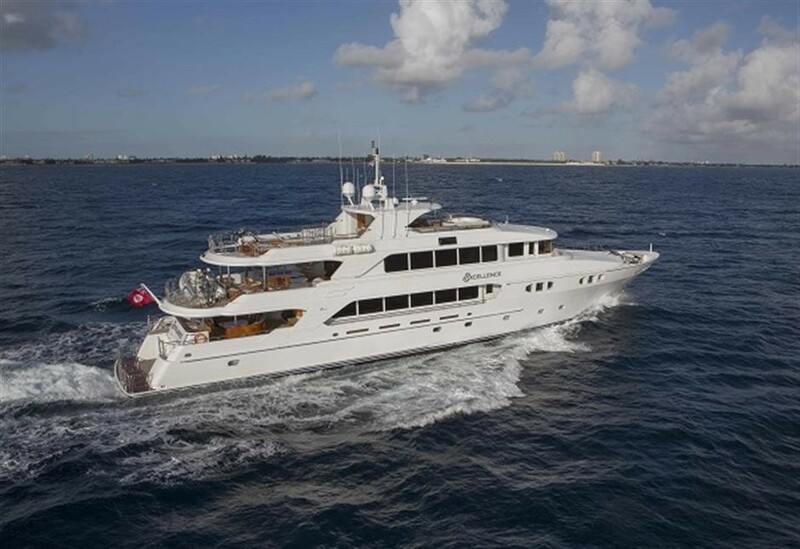 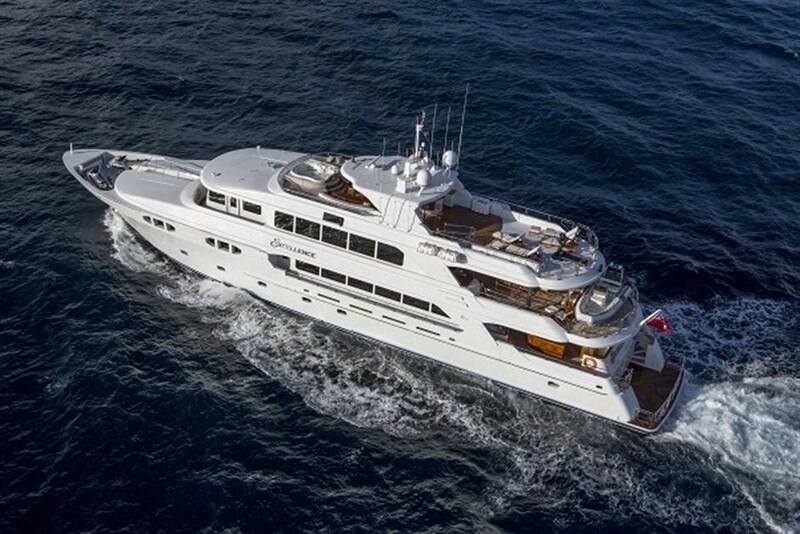 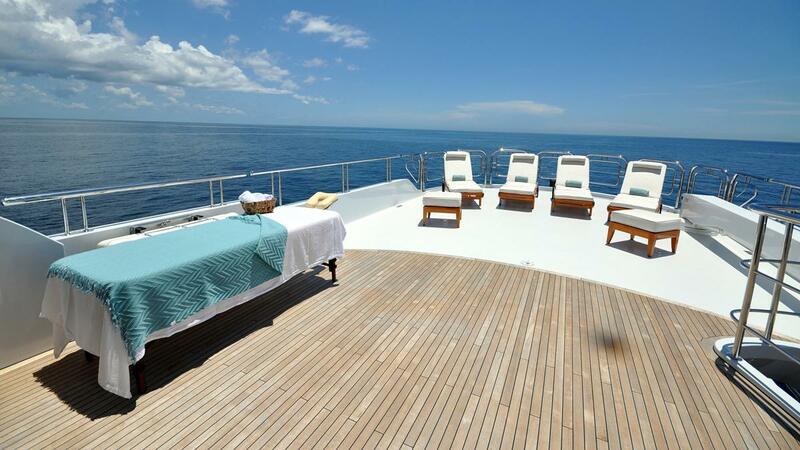 She can accommodate up to 12 charter guests in 6 supreme cabins. 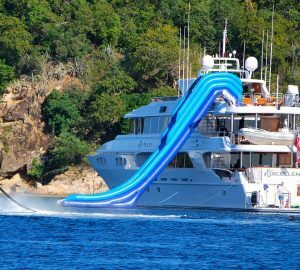 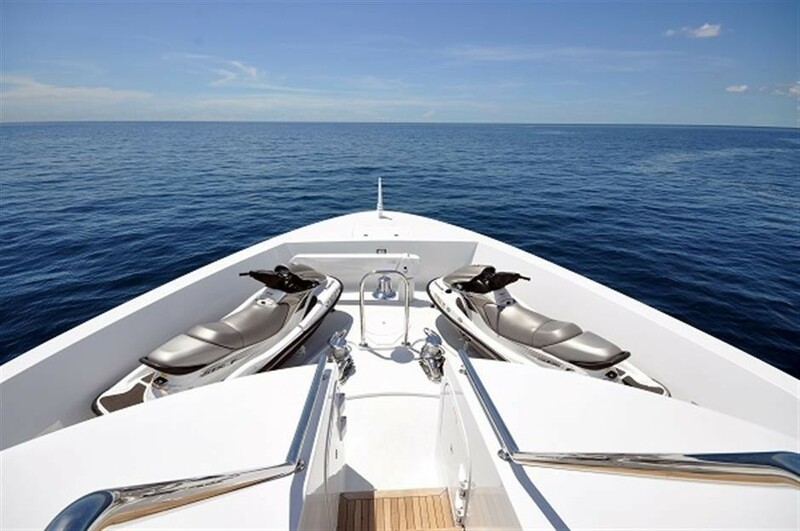 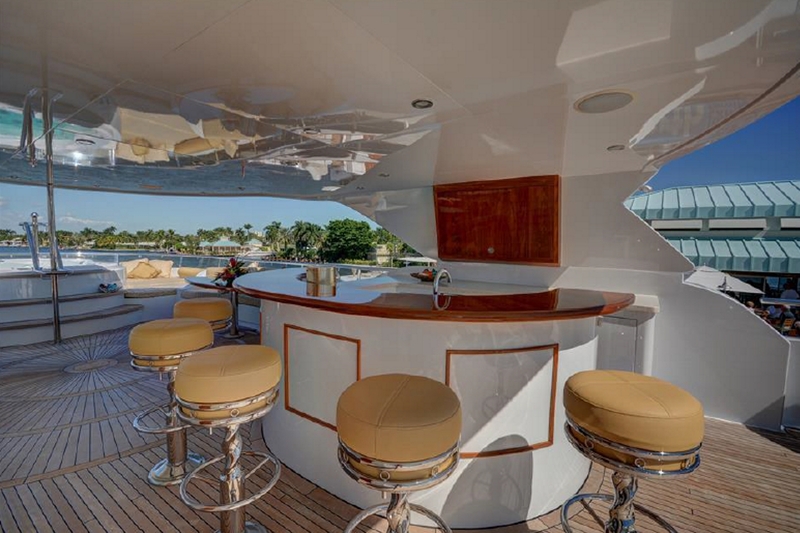 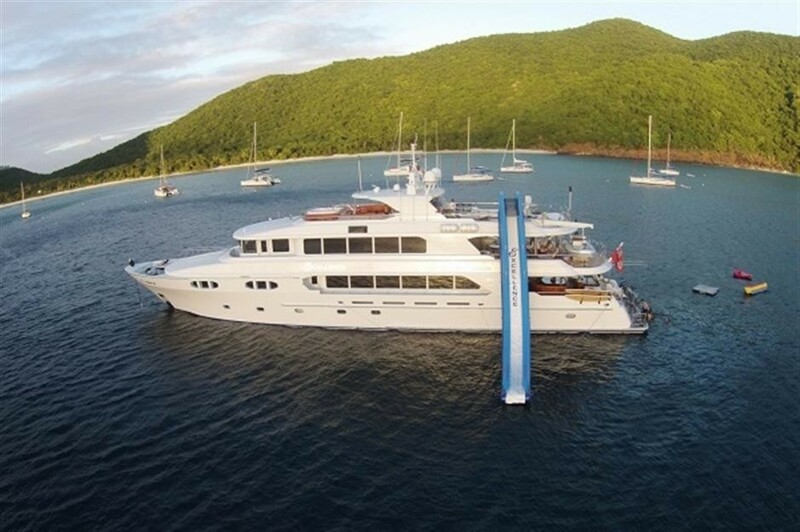 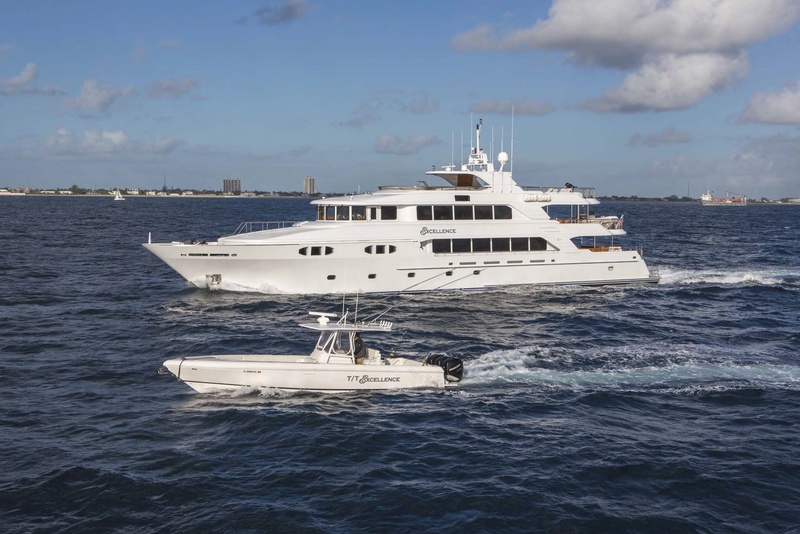 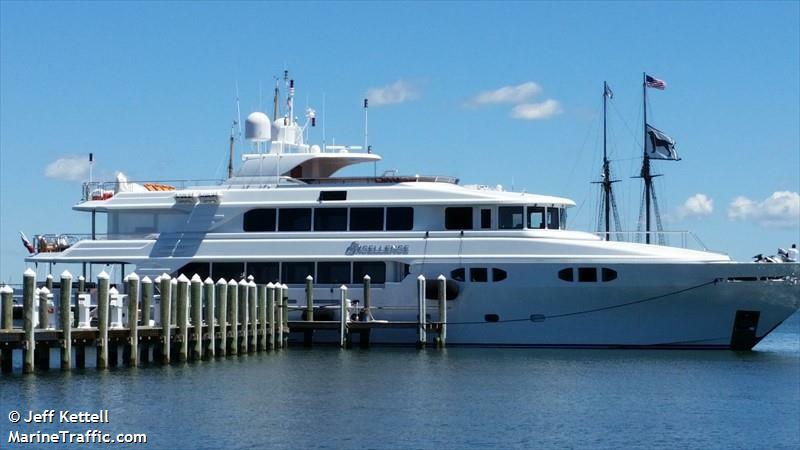 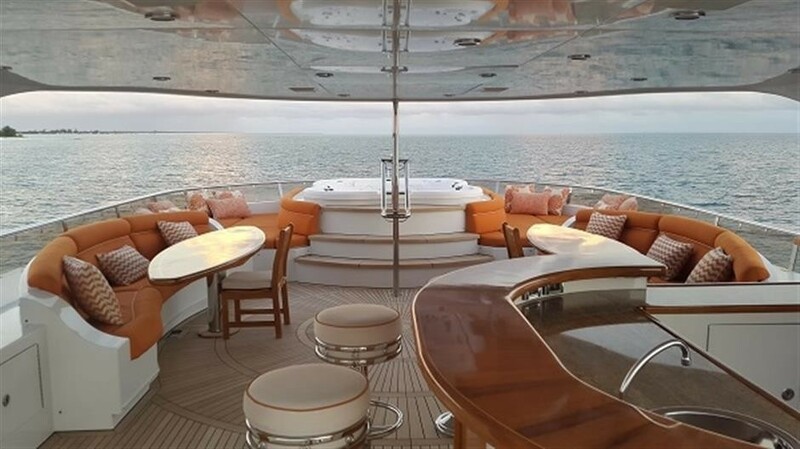 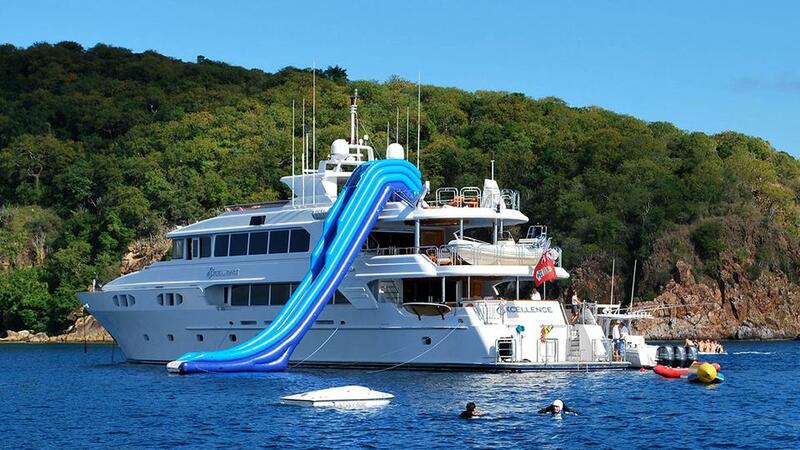 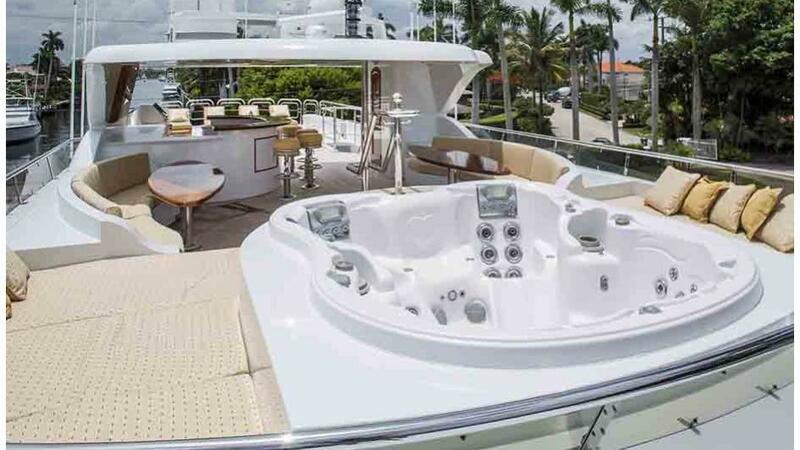 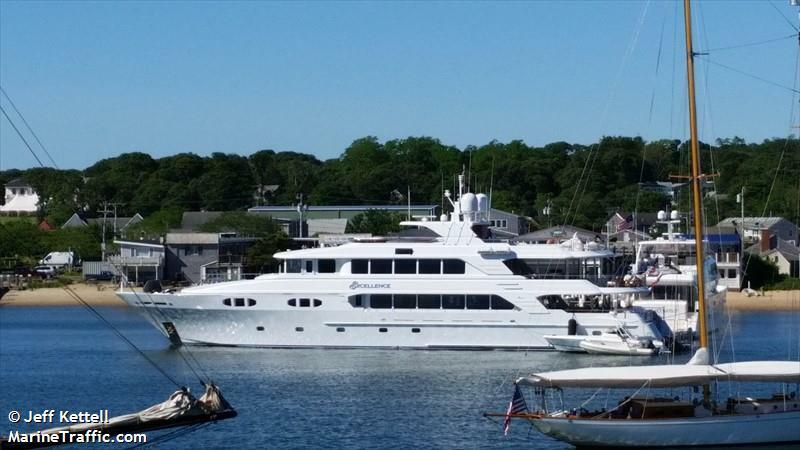 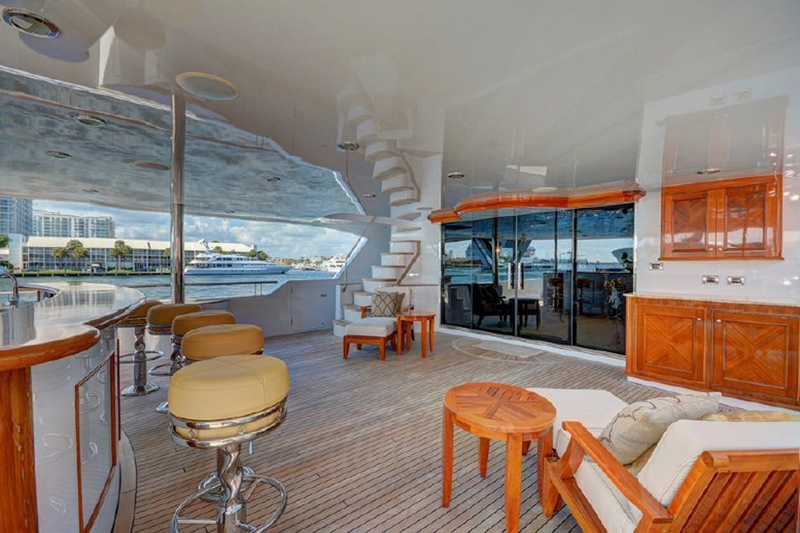 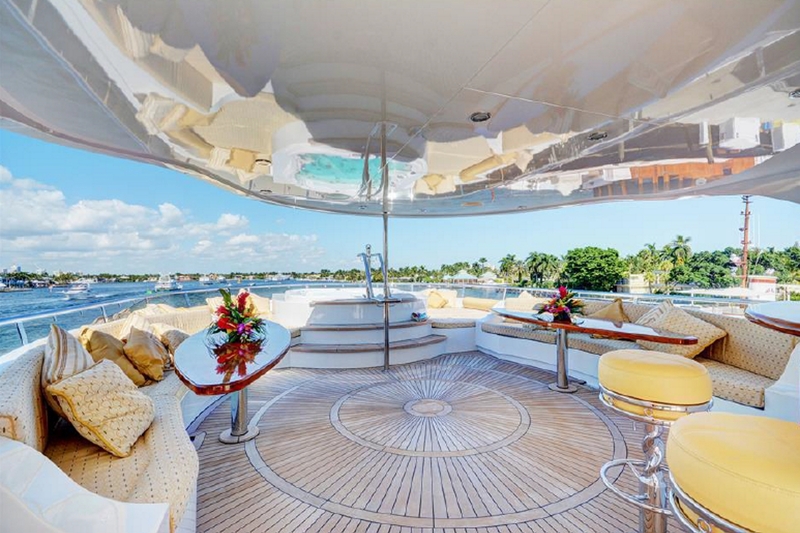 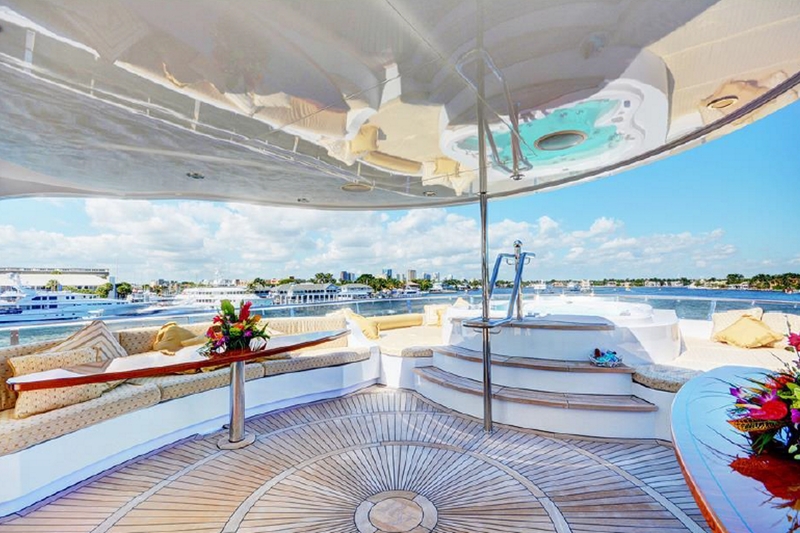 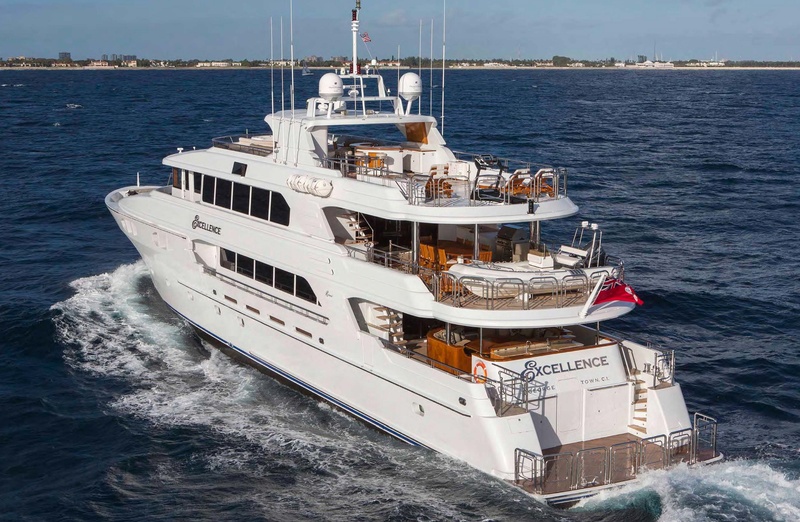 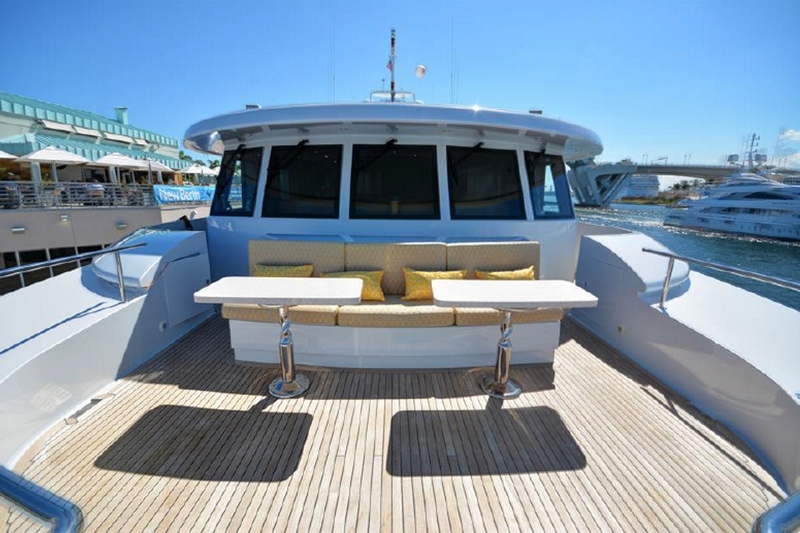 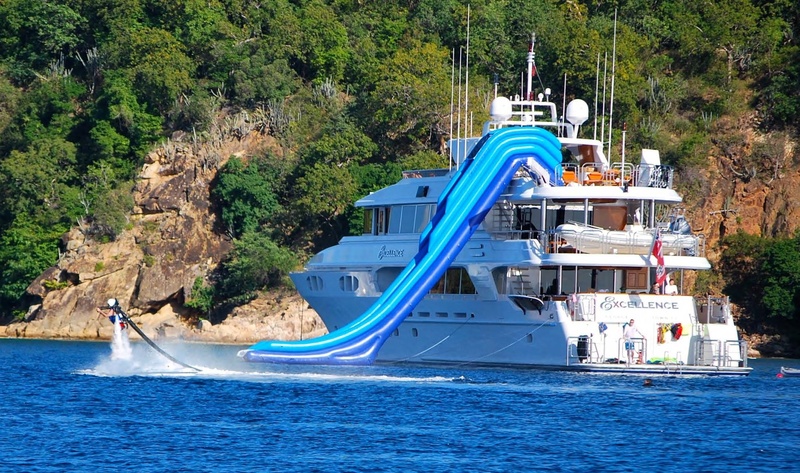 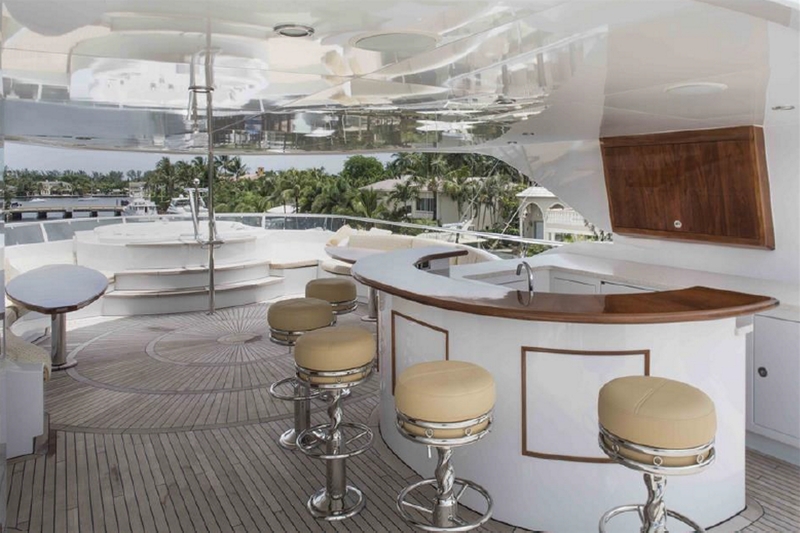 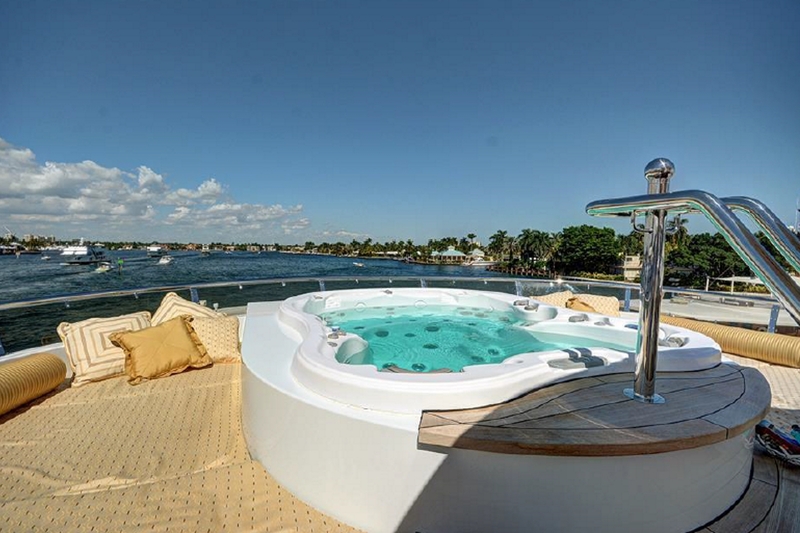 EXCELLENCE'S NOTABLE FEATURES: Impressive array of water toys including a slide from top deck ~ Gym equipment ~ Full-service bar ~ Jacuzzi tub ~ Generous seating areas. 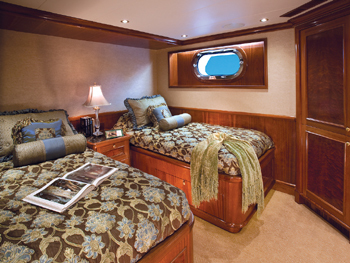 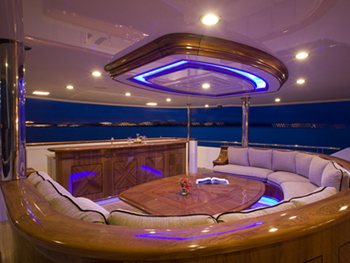 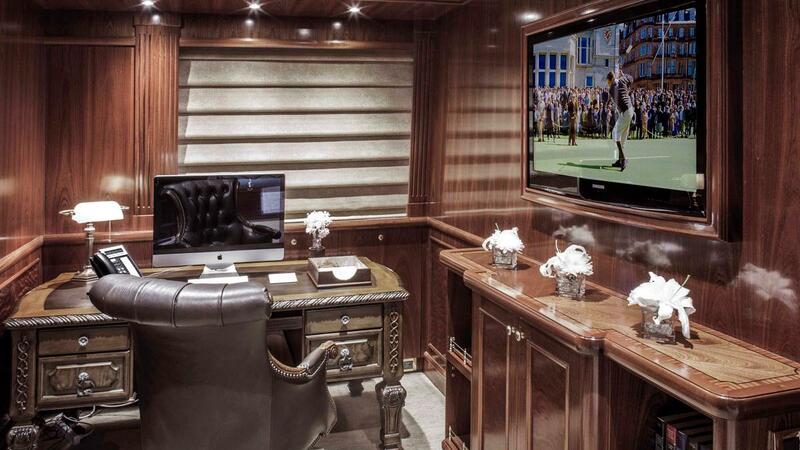 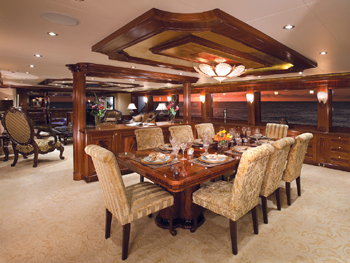 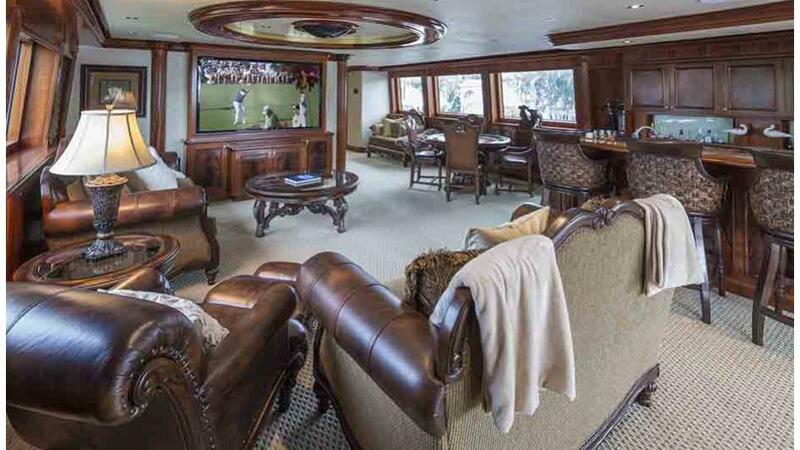 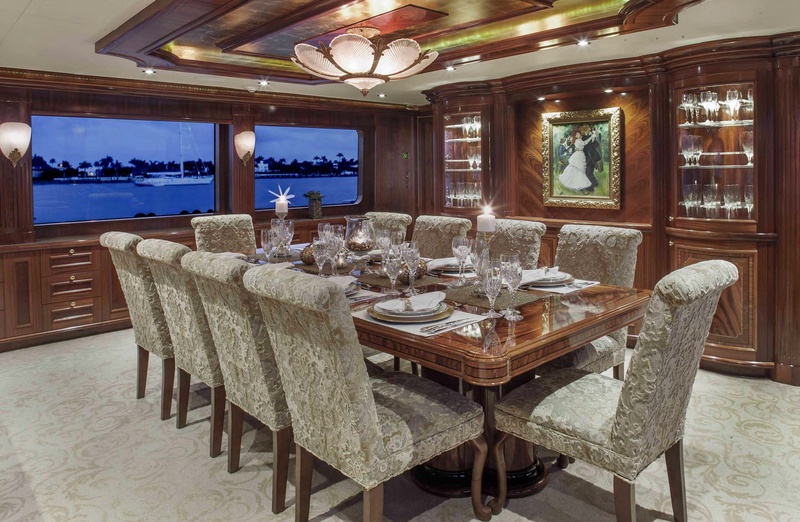 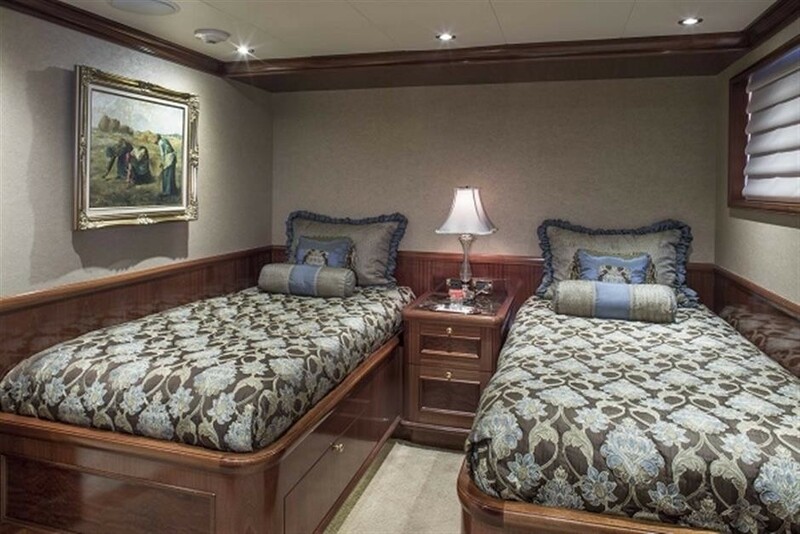 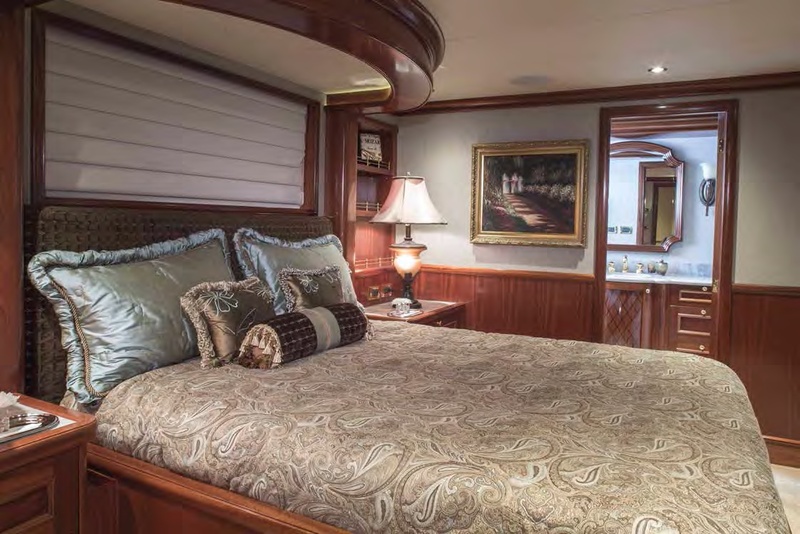 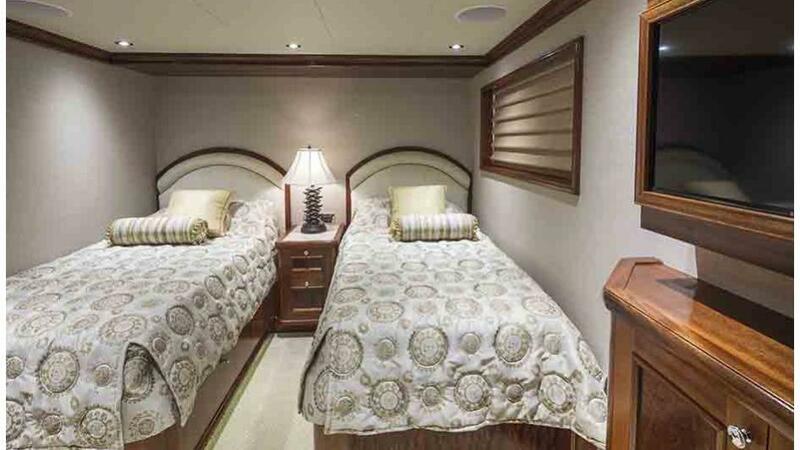 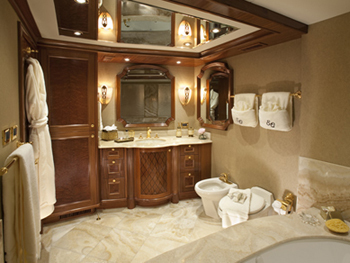 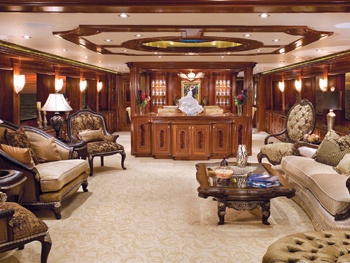 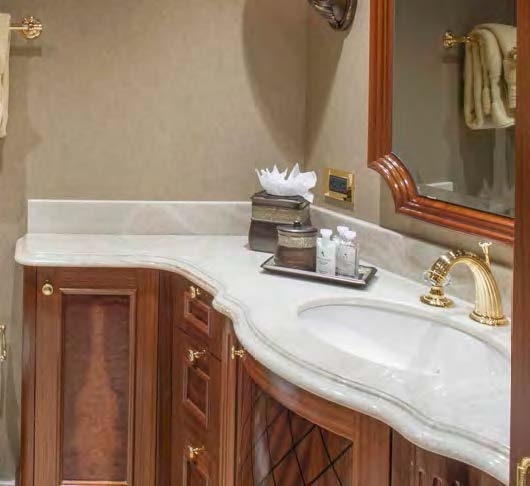 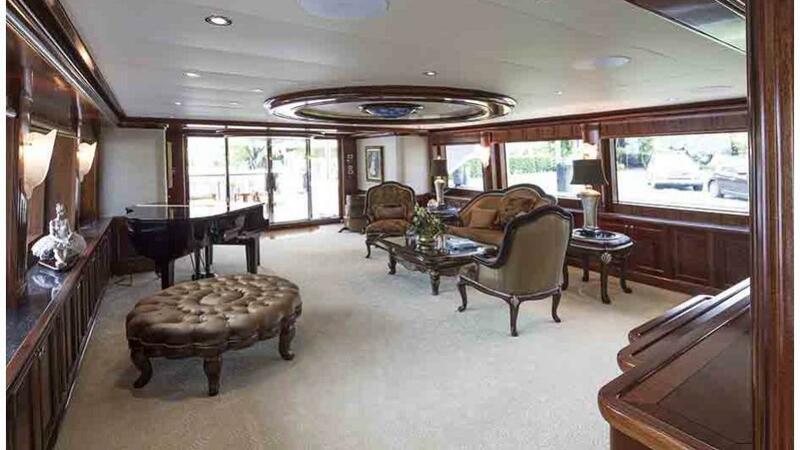 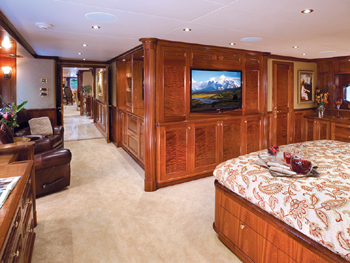 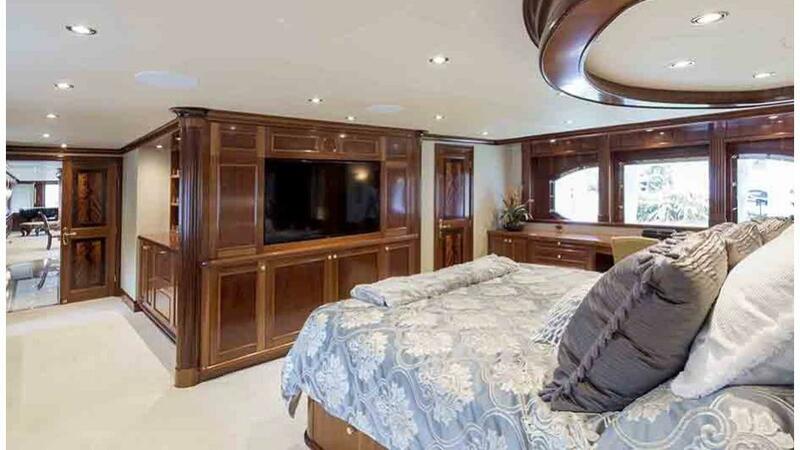 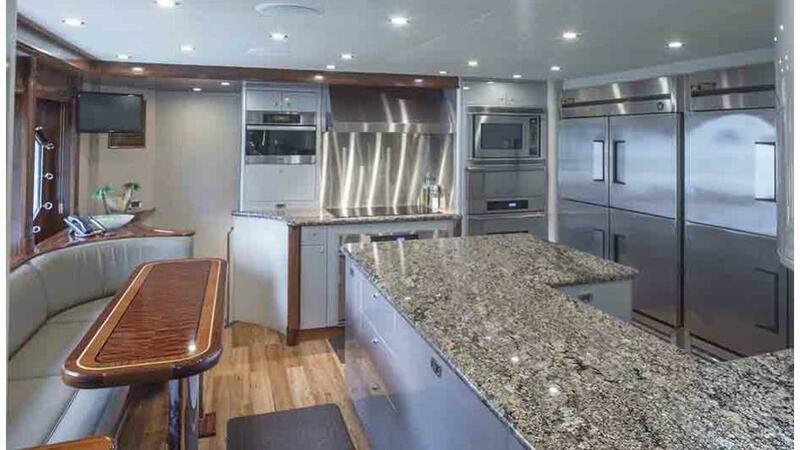 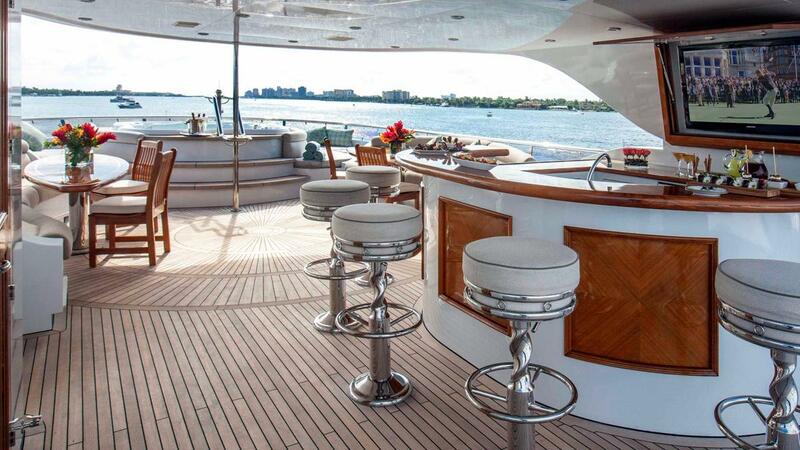 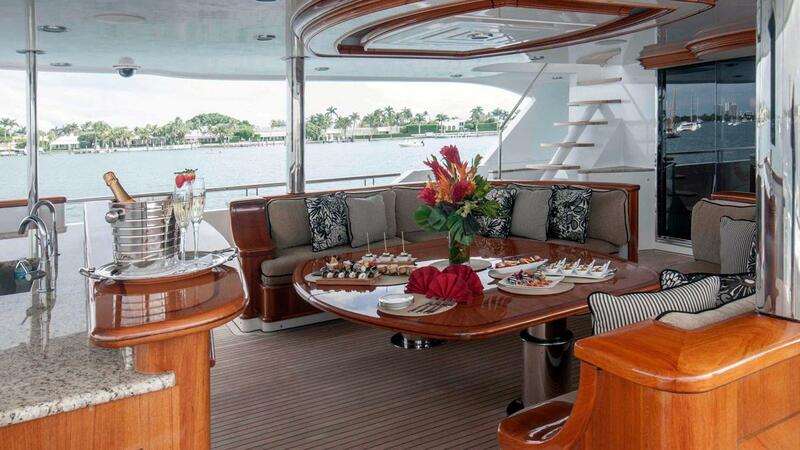 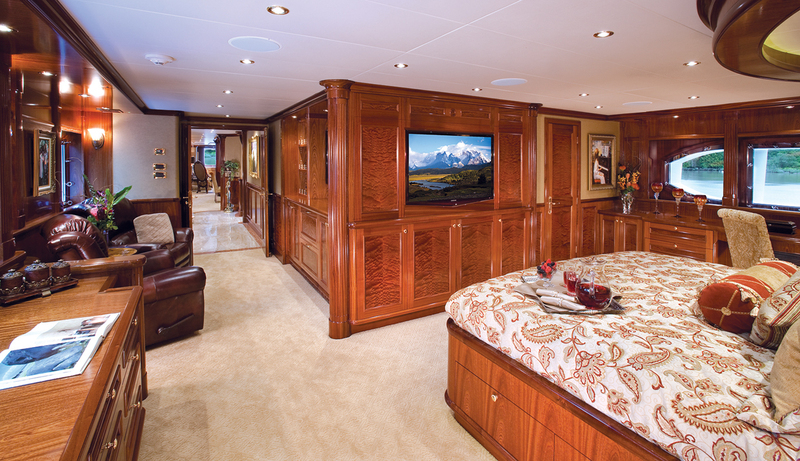 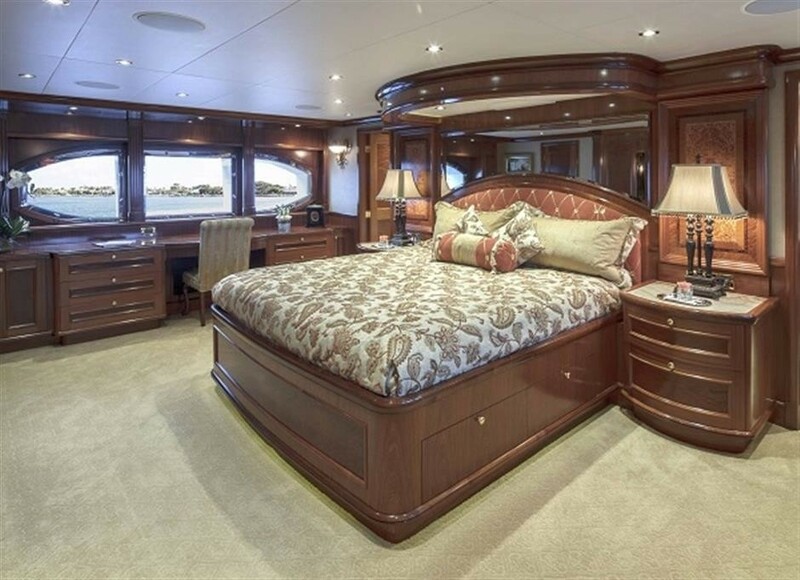 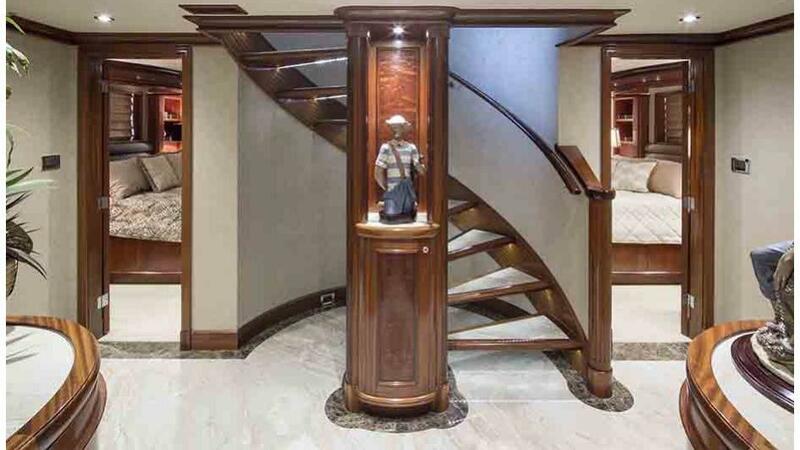 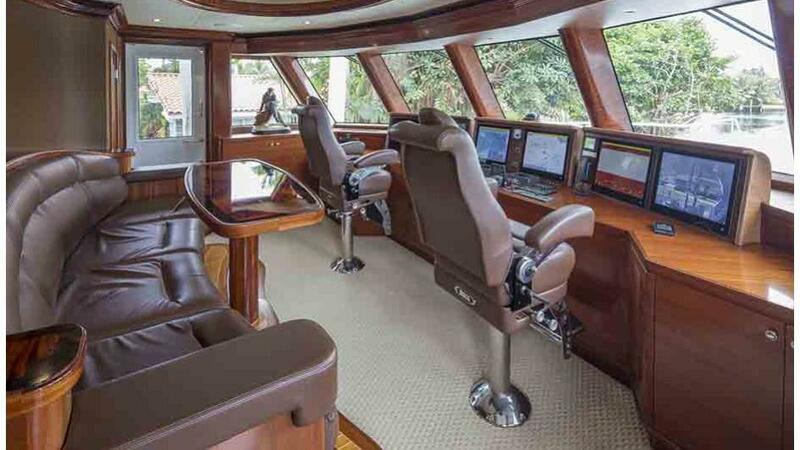 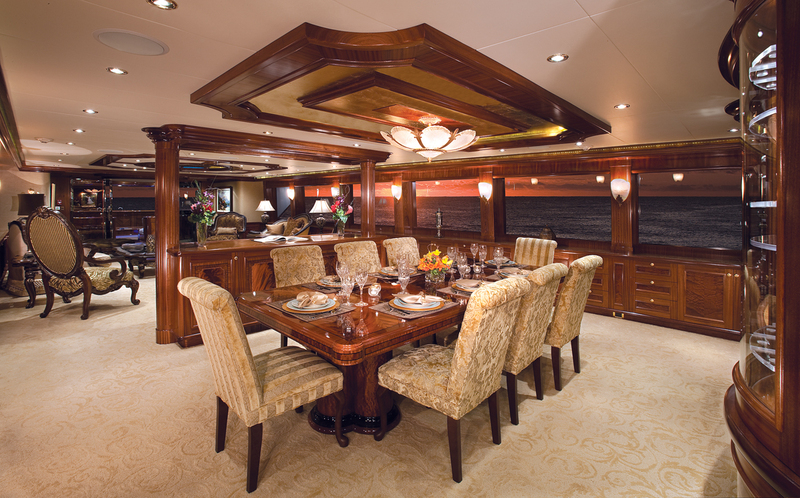 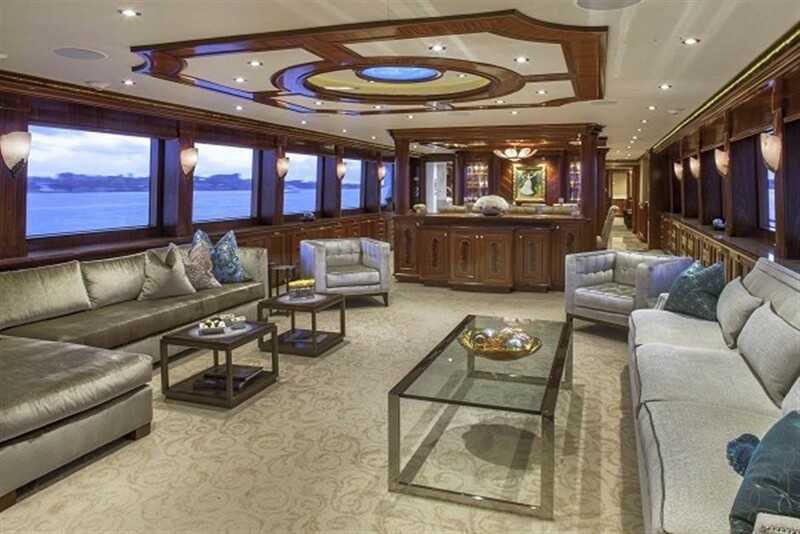 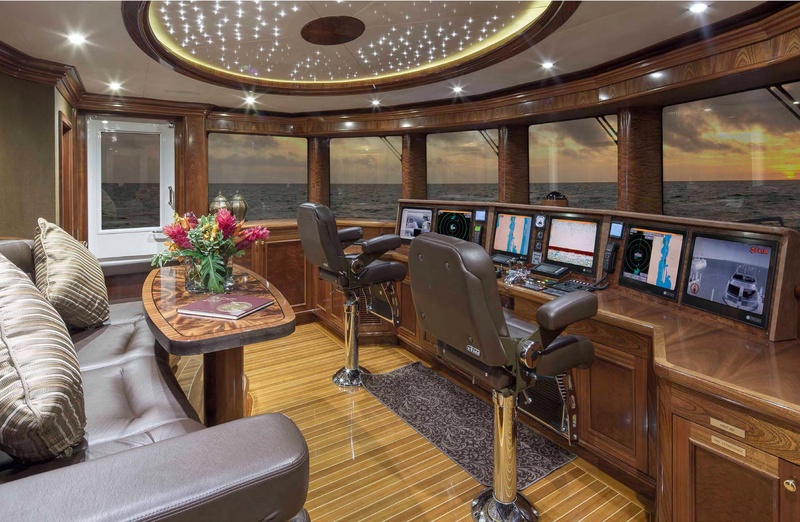 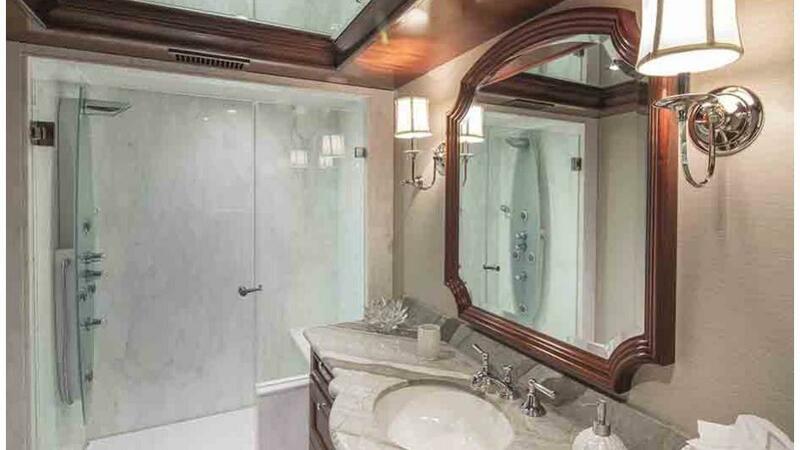 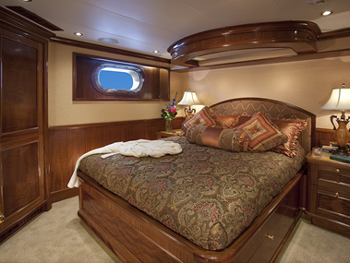 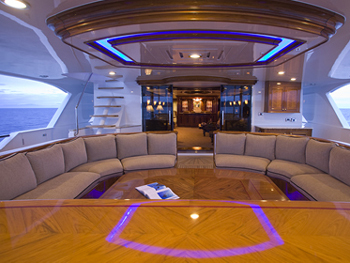 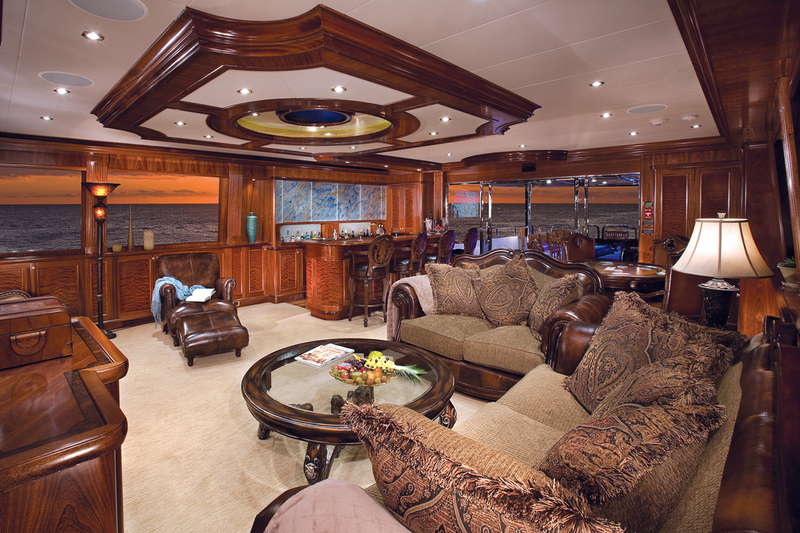 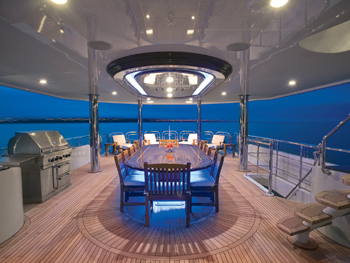 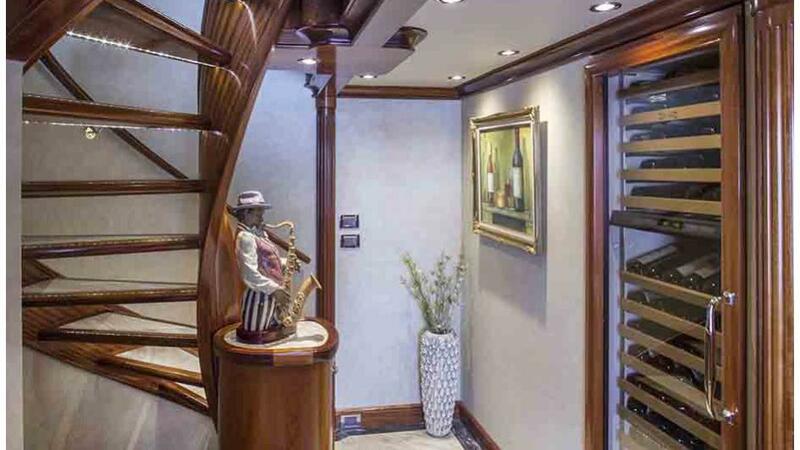 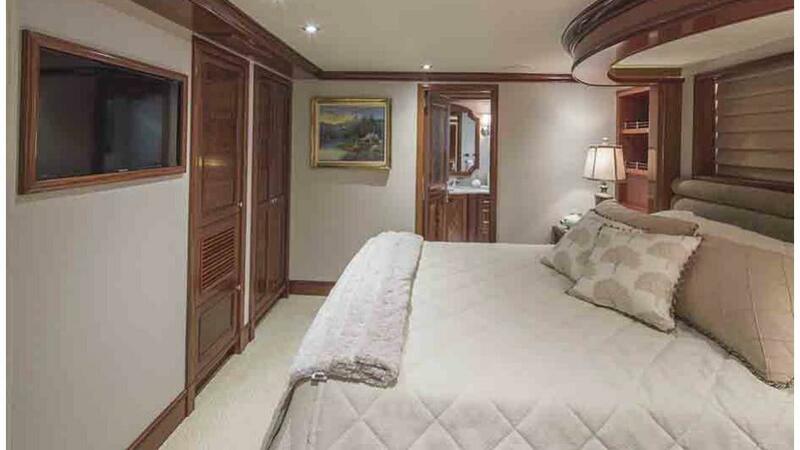 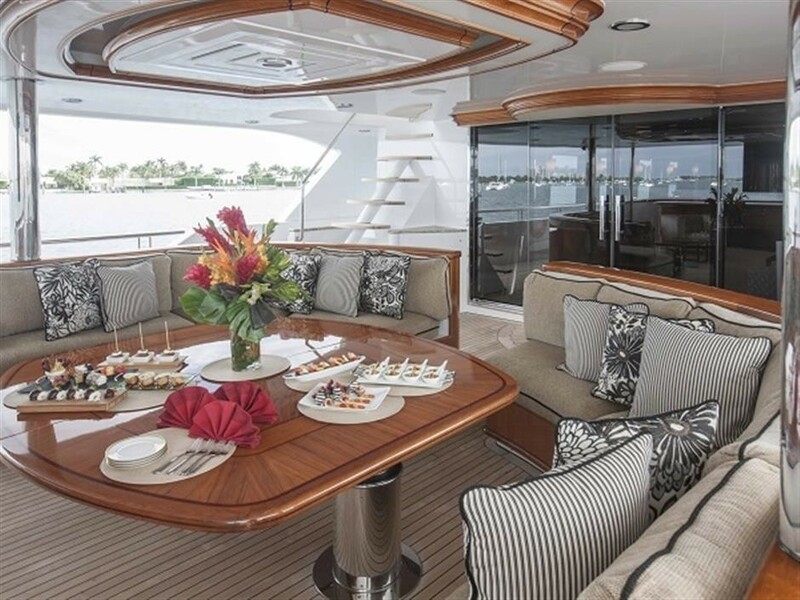 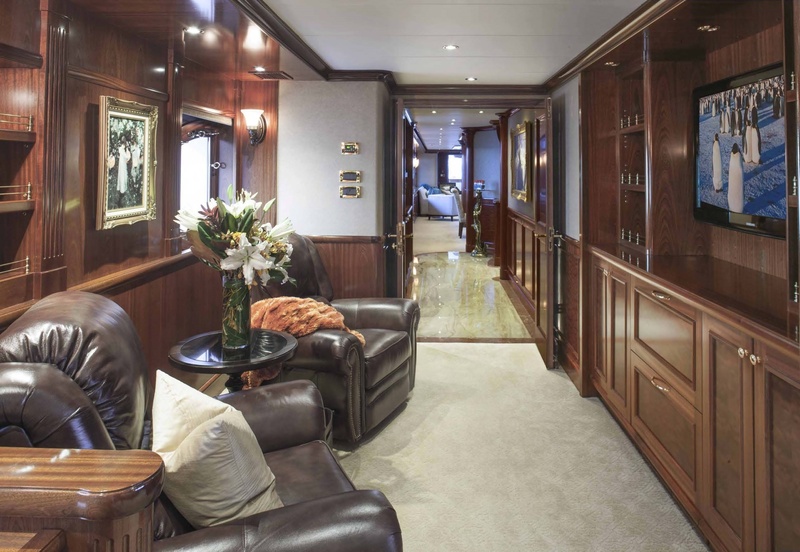 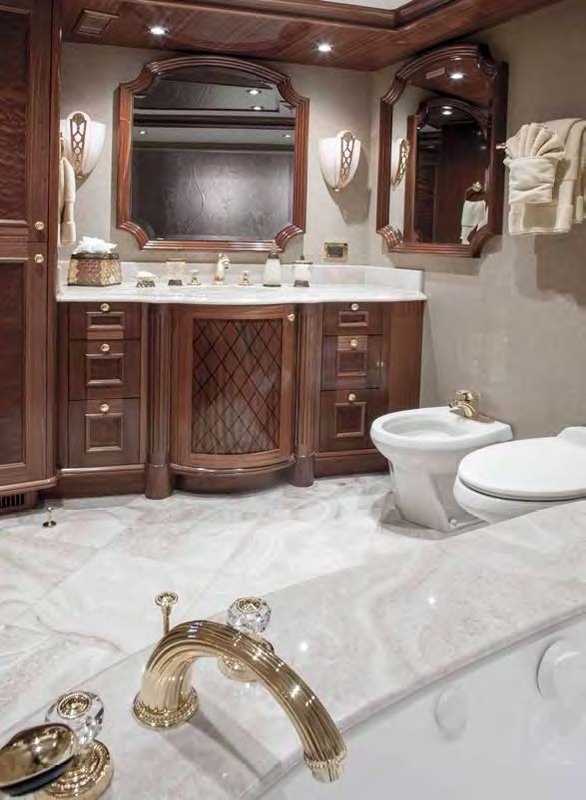 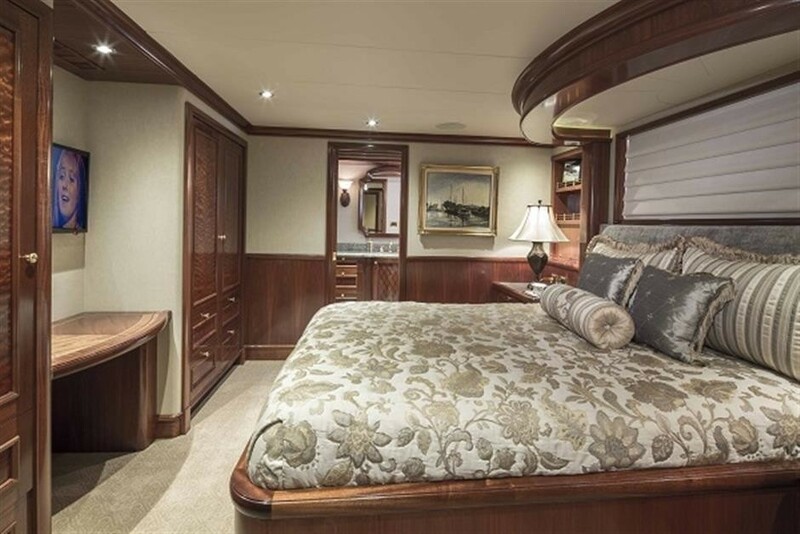 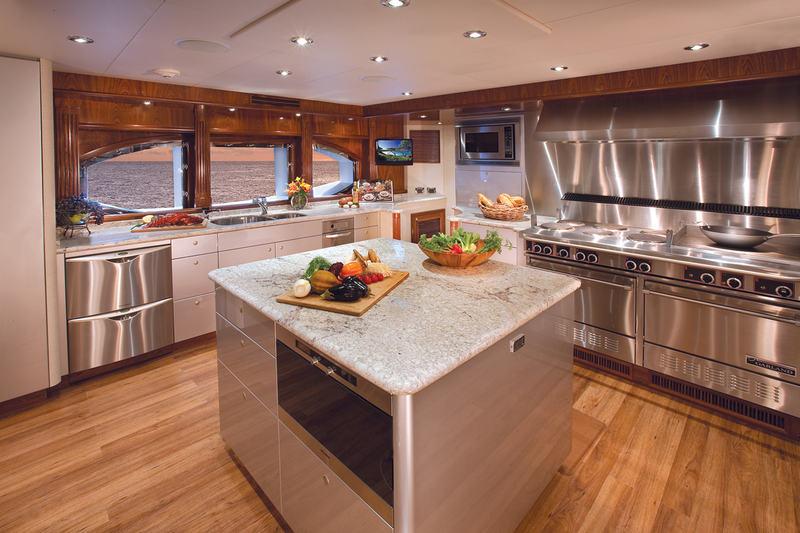 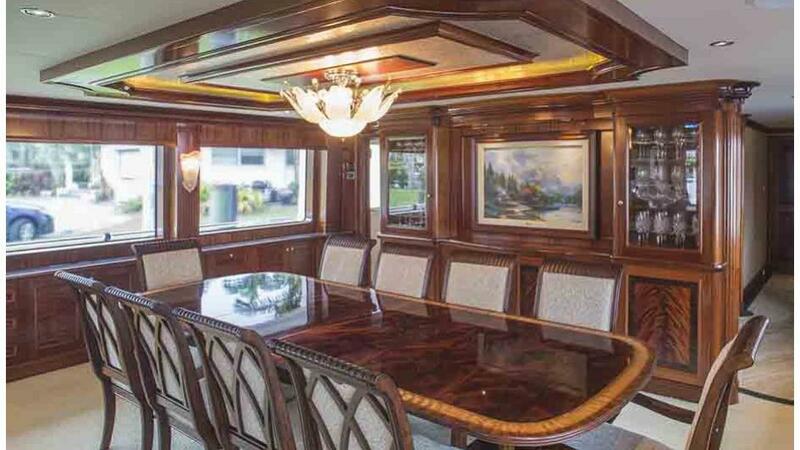 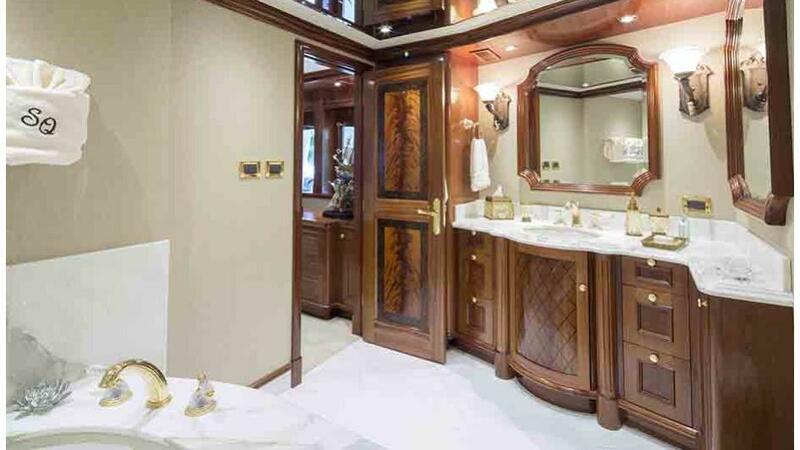 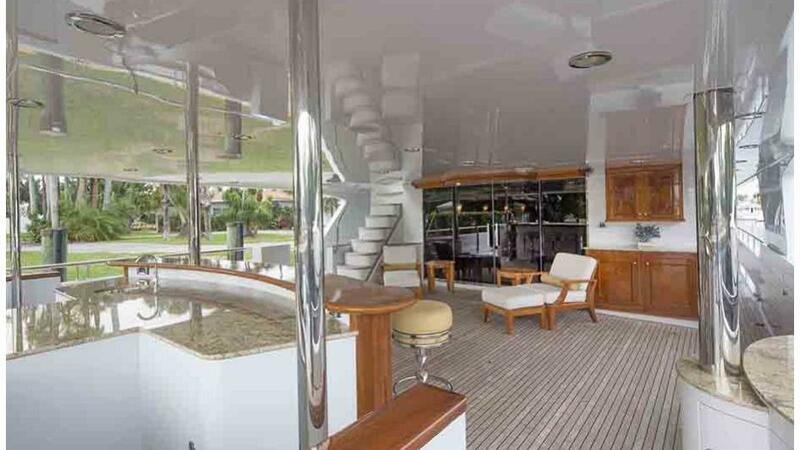 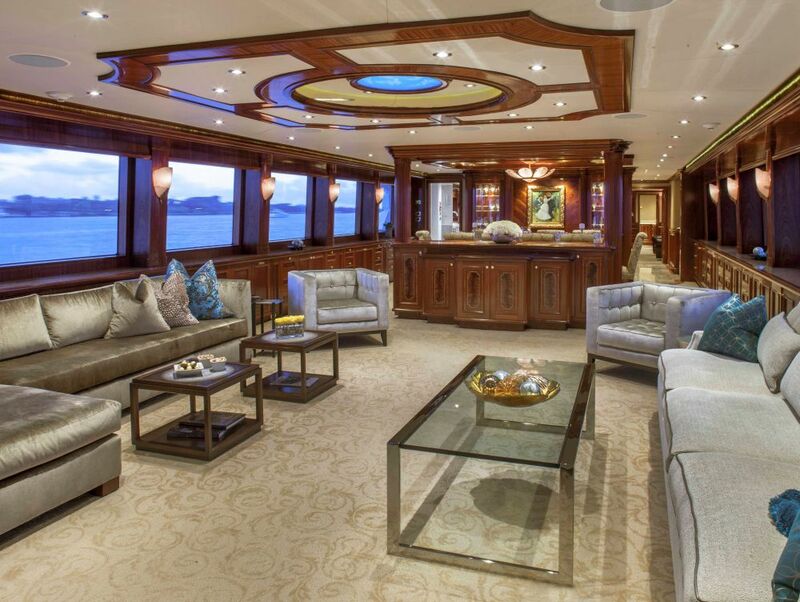 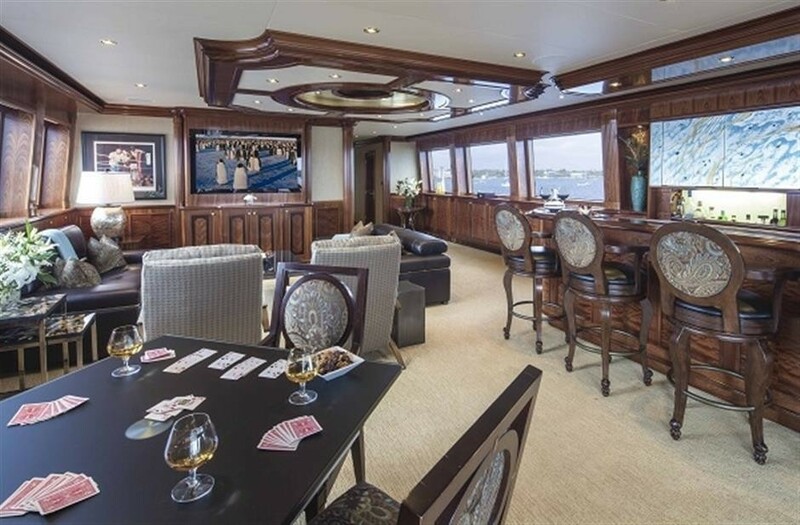 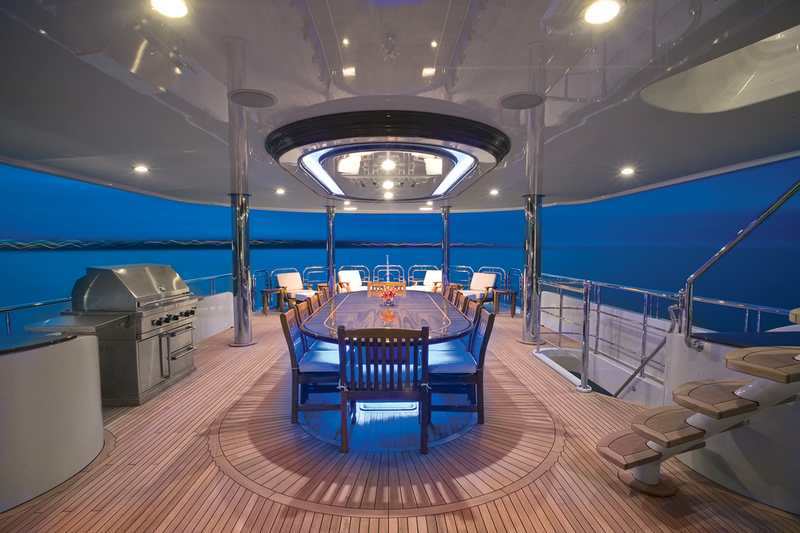 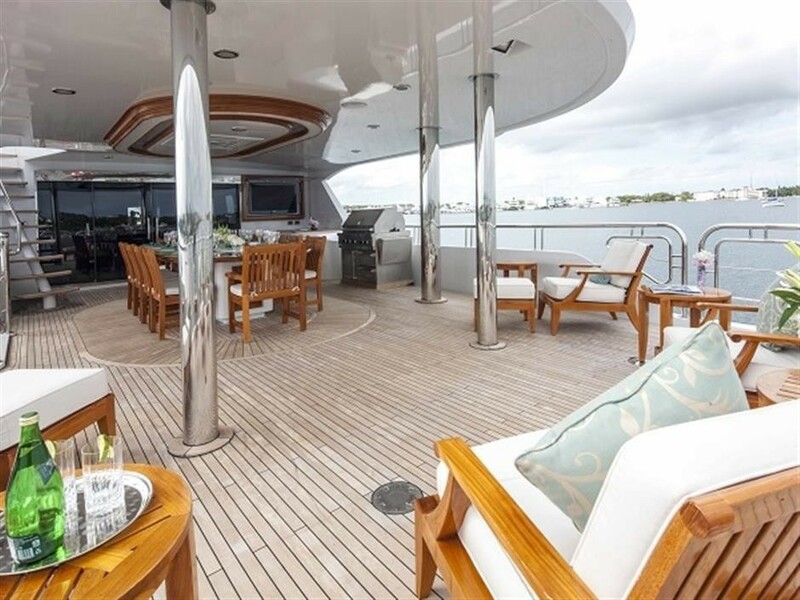 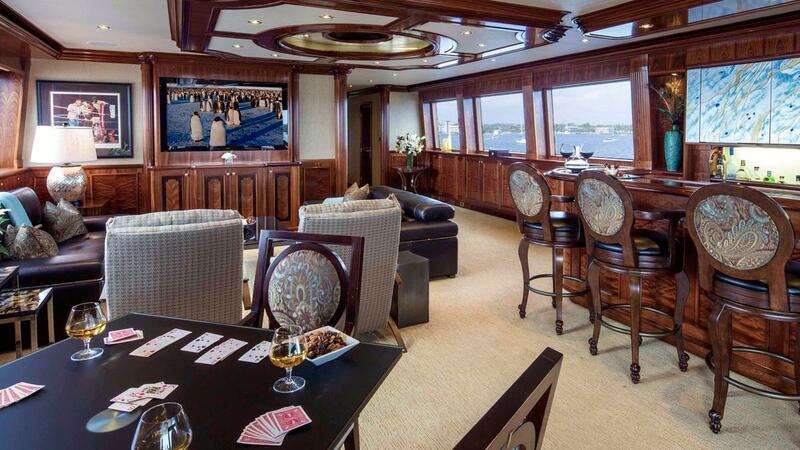 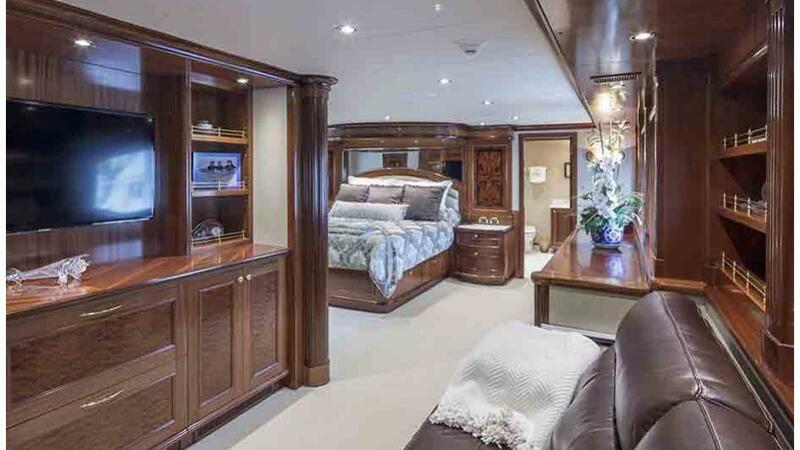 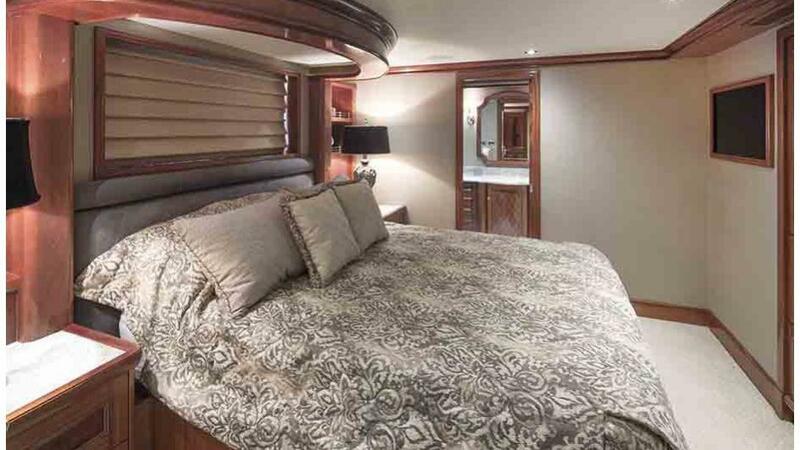 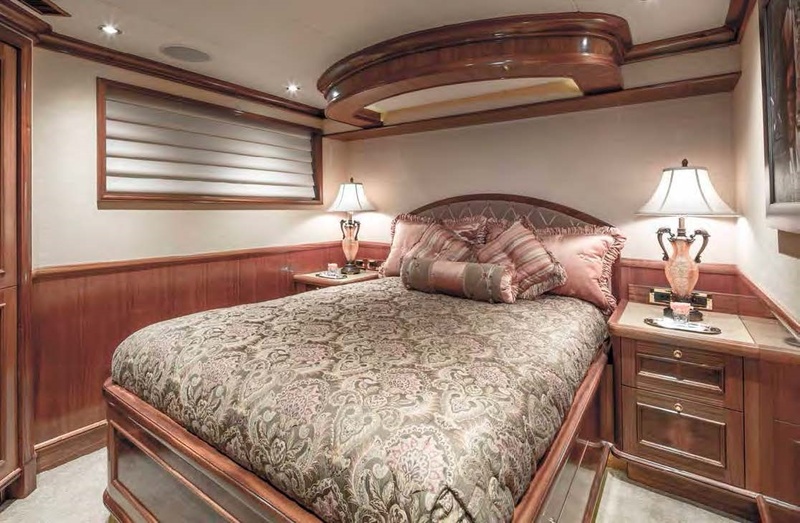 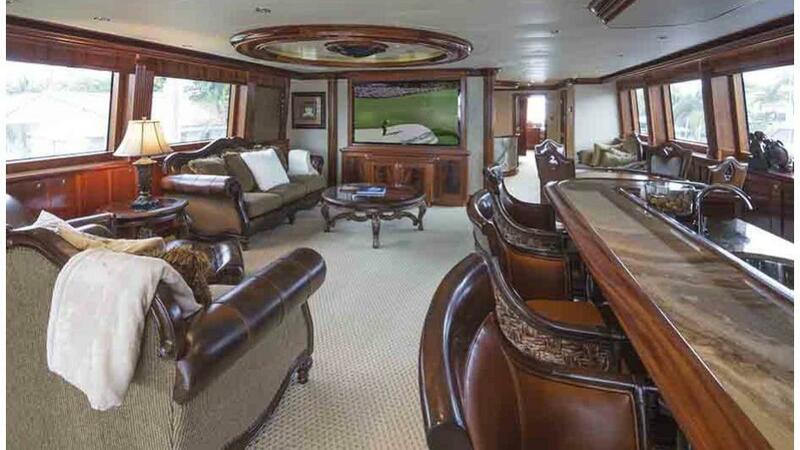 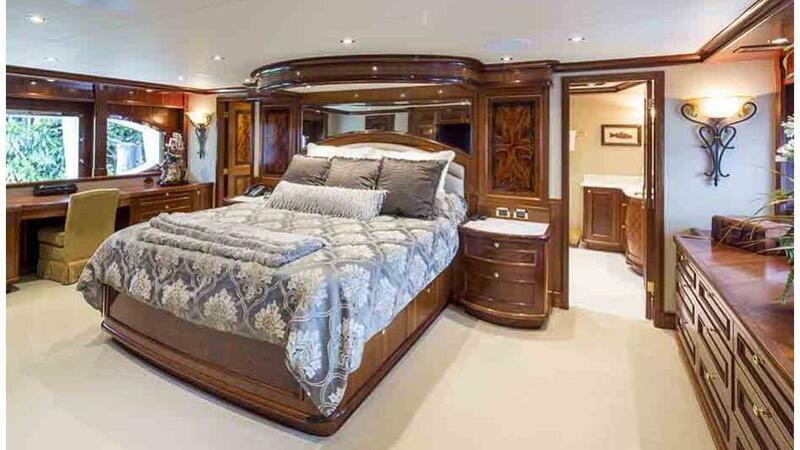 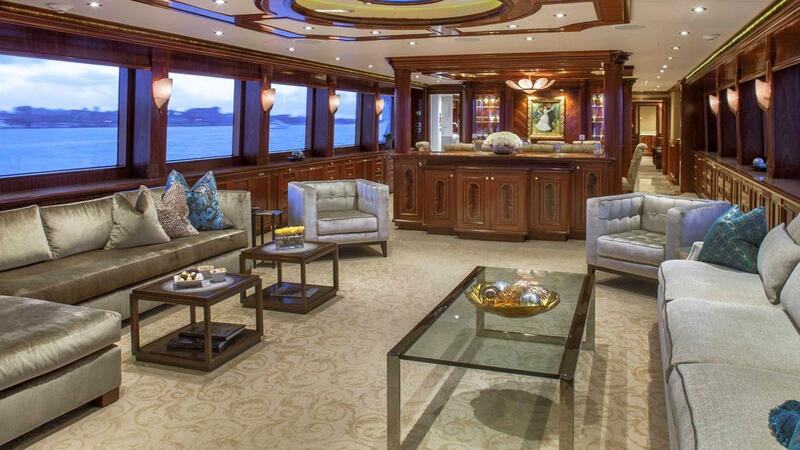 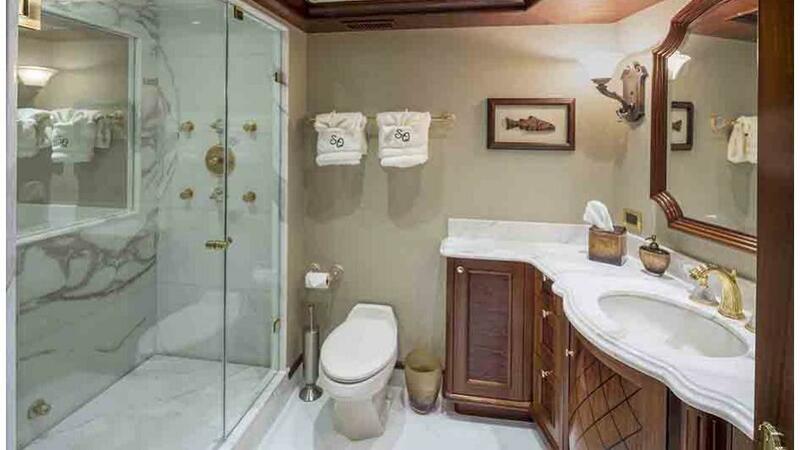 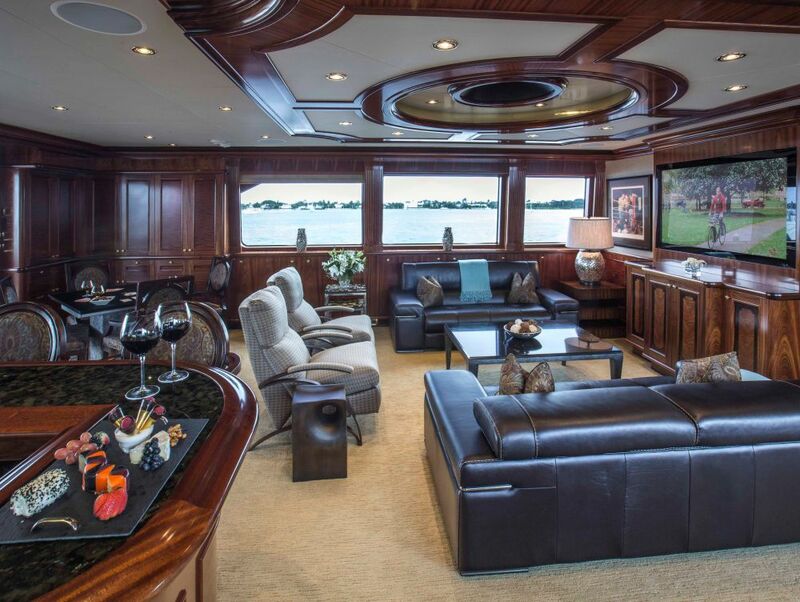 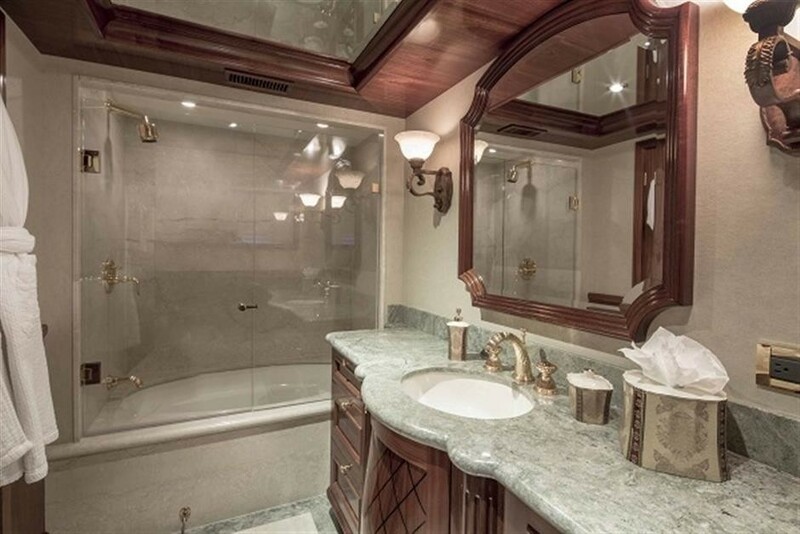 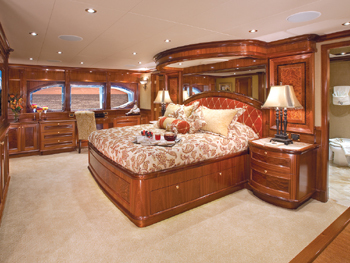 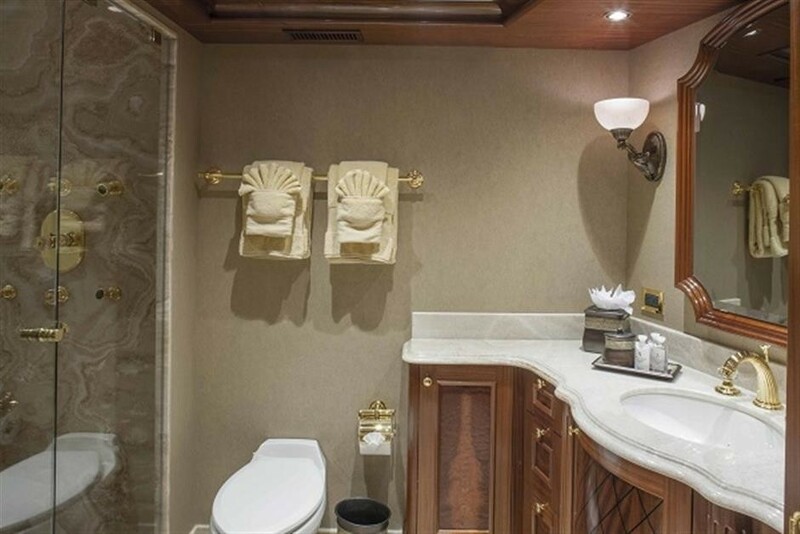 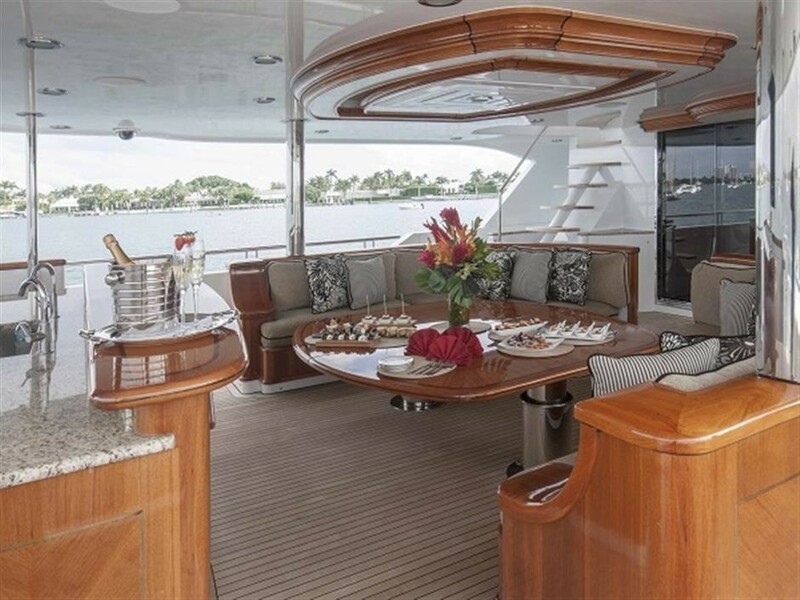 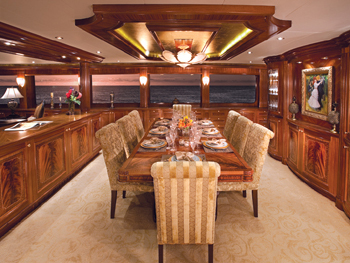 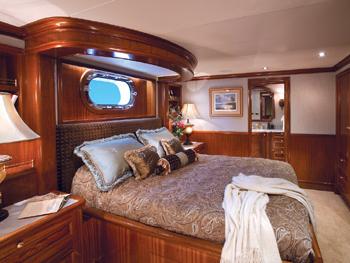 The stately interior of this yacht features a well-balanced décor of rich woods and fine furnishings. 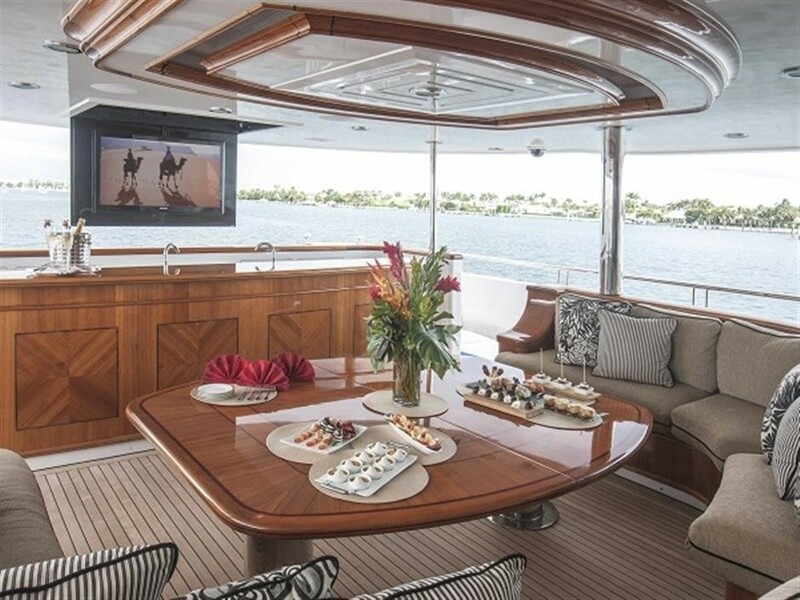 The main salon is spacious offering an L shaped sofa and occasional chairs in a cool grey tone, an island credenza offers a retractable TV and gives an elegant yet casual separation to the formal dining area forward. 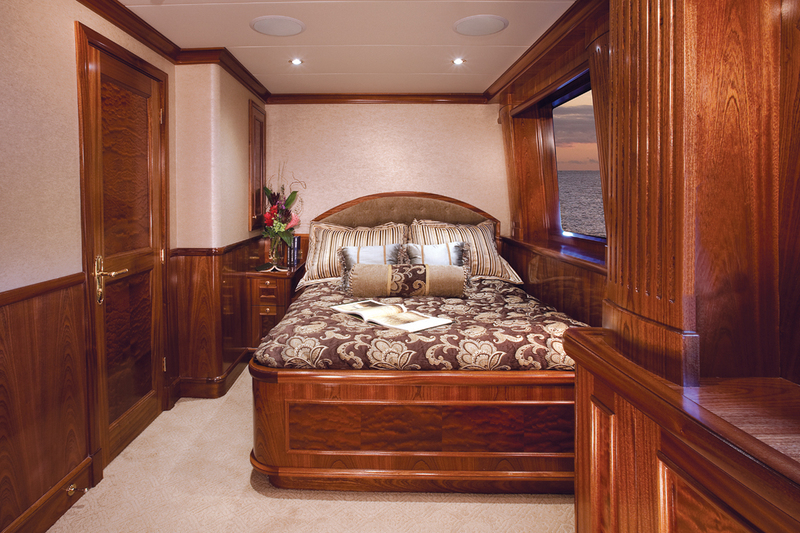 To starboard, a marble hall leads to the master cabin, which offers a king size bed, private study and his and hers facilities. 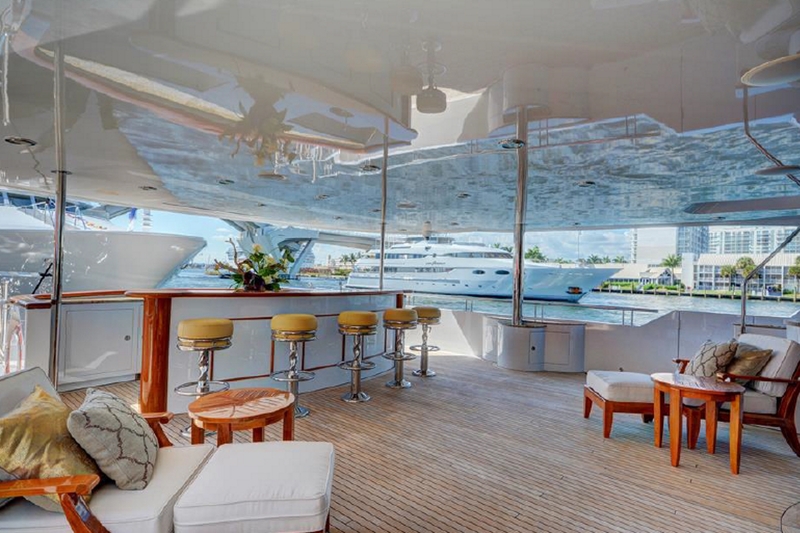 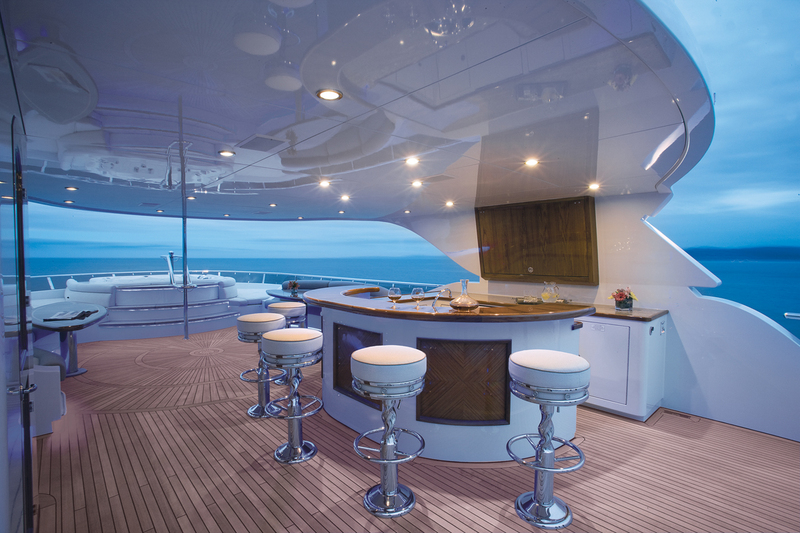 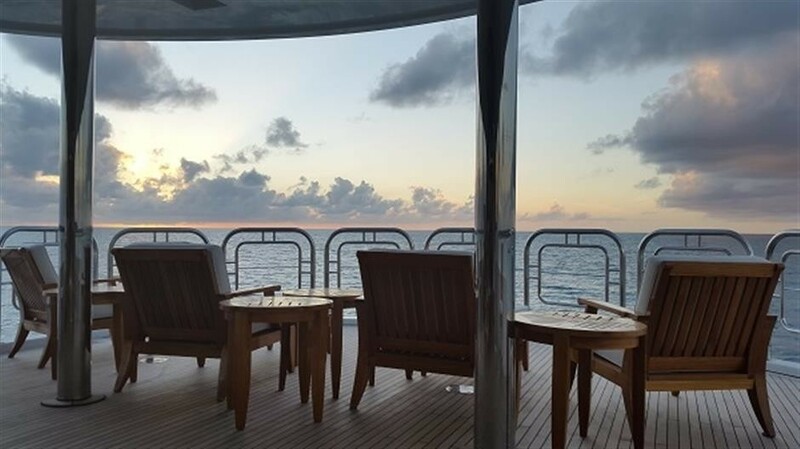 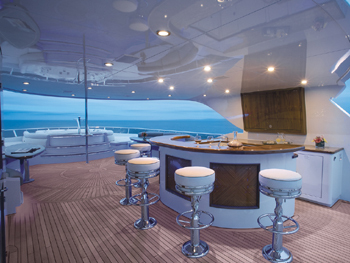 The main deck features panoramic windows, creating a greater sense of space, whilst providing breathtaking views. 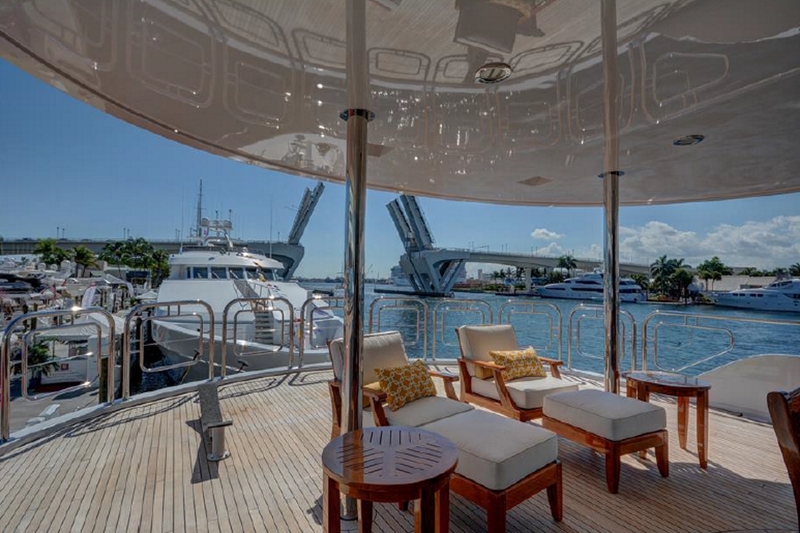 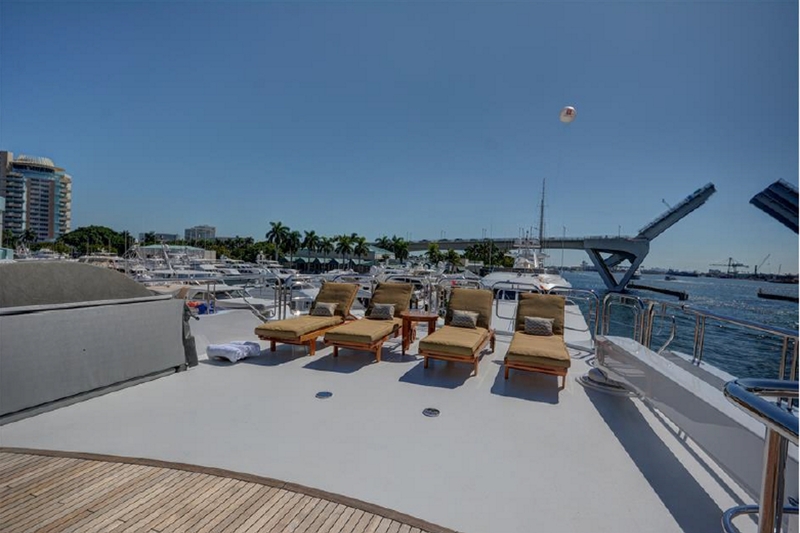 EXCELLENCE boasts a generous shaded aft deck adjacent to the salon, complete with plush exterior seating, large coffee table and full wet bar. 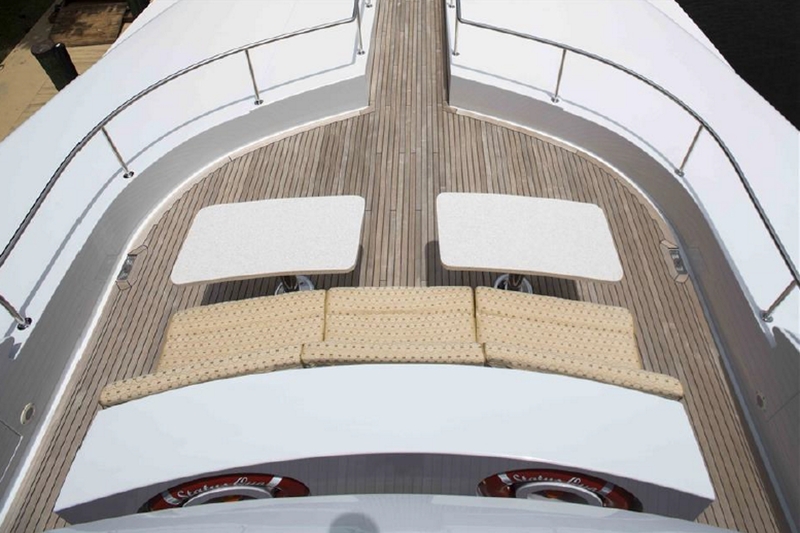 Further aft the full beam extended swim platform allows easy access to the water toys and doubles as a great teak beach. 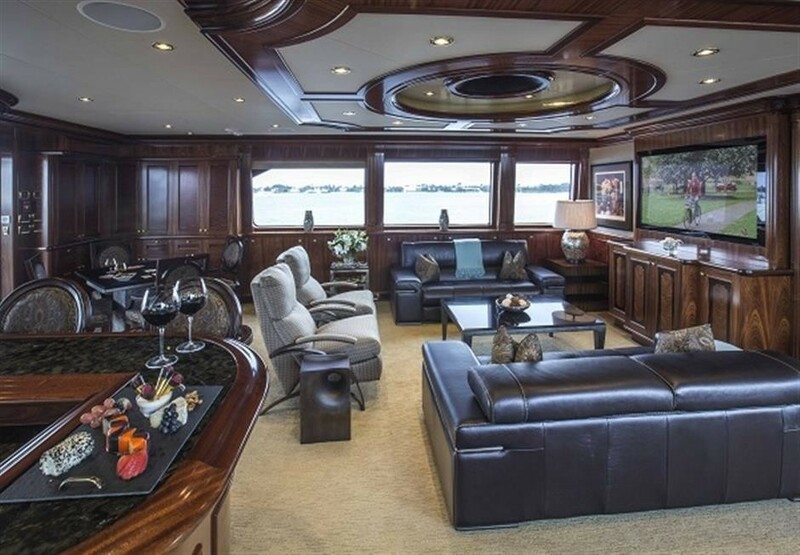 Her upper deck offers an additional relaxing indoor space in the sky lounge, here quality leather sofas, reclining chairs and a large flat screen TV, make the room ideal for keeping up with the latest sports. 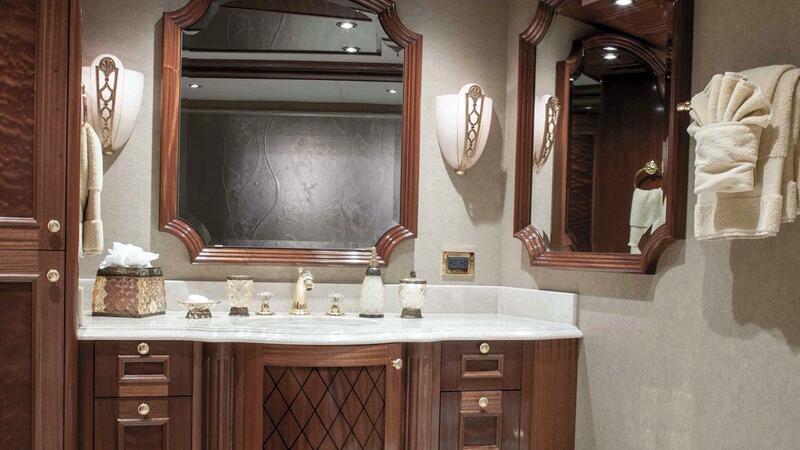 A complete marble wet bar with gold fittings add an elegant atmosphere. 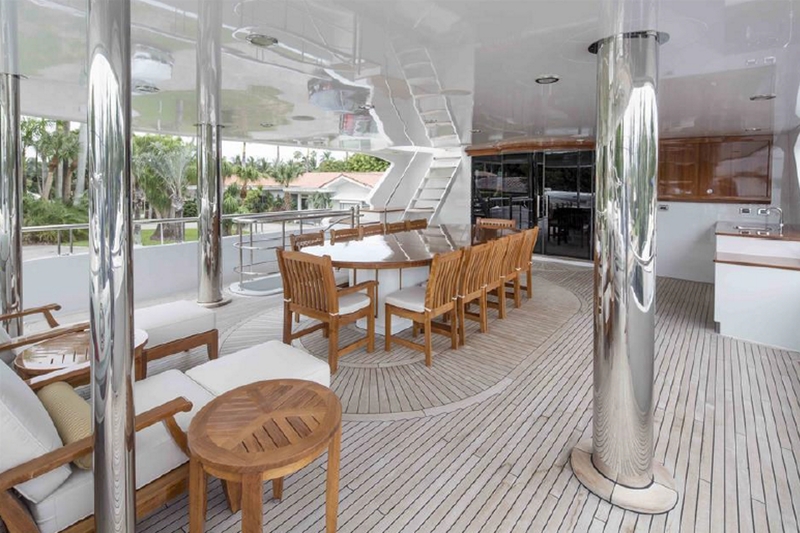 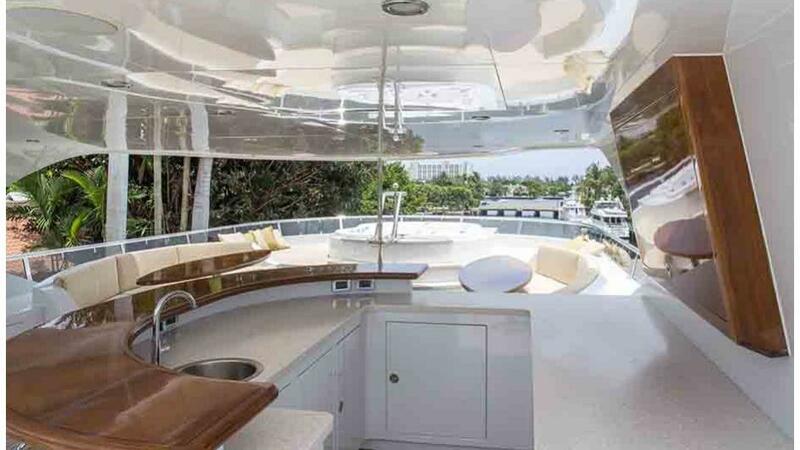 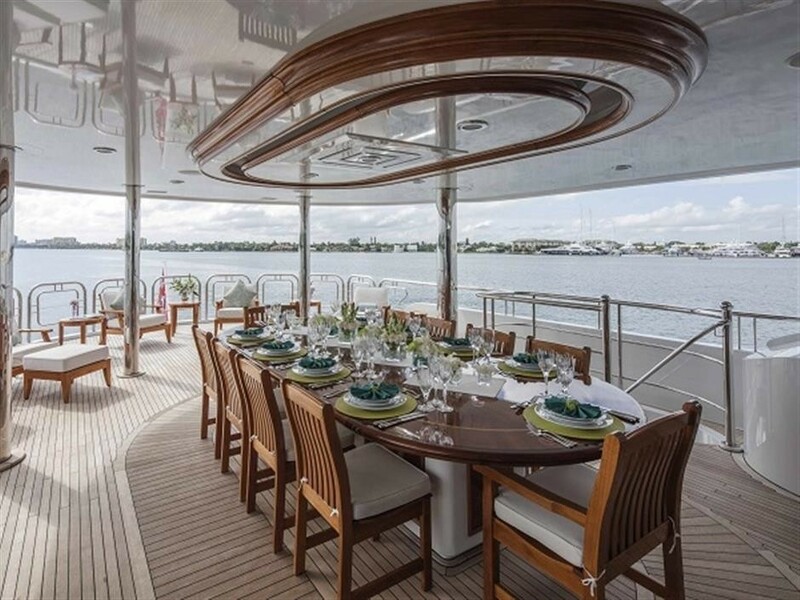 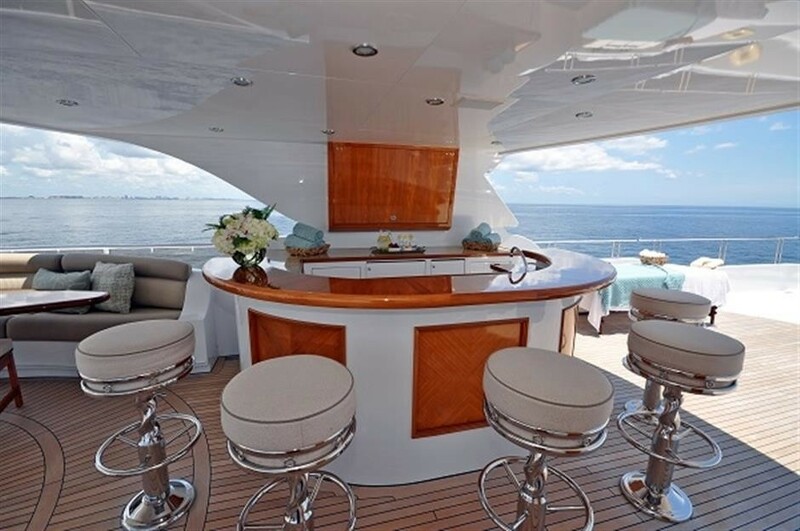 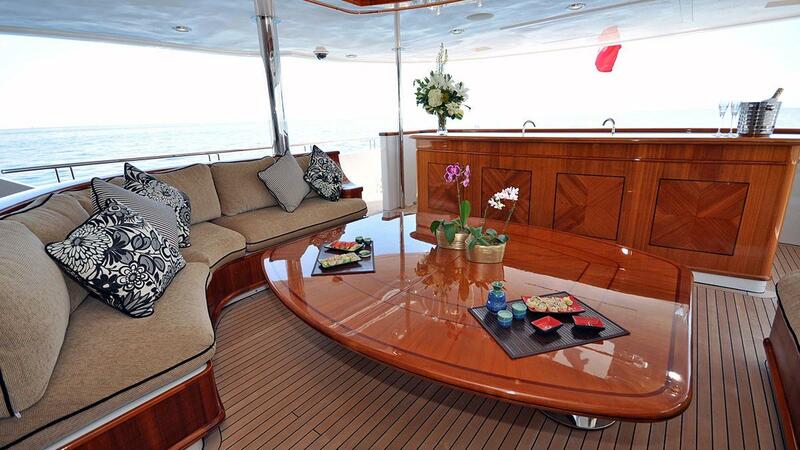 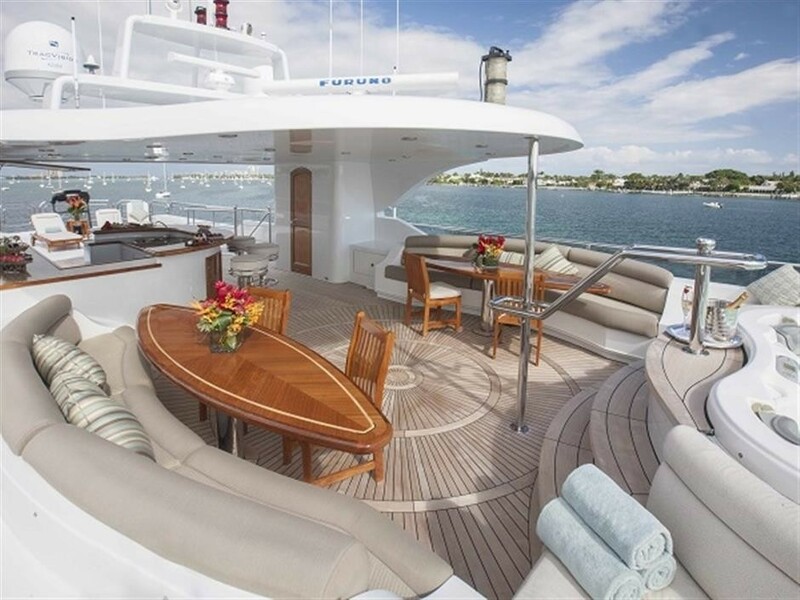 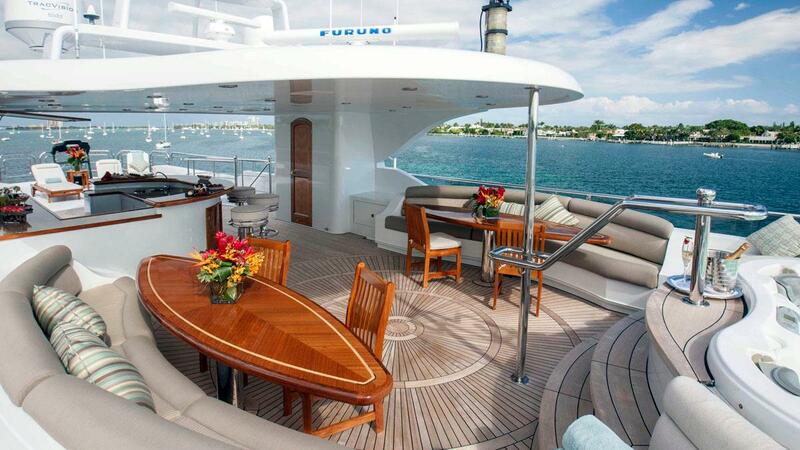 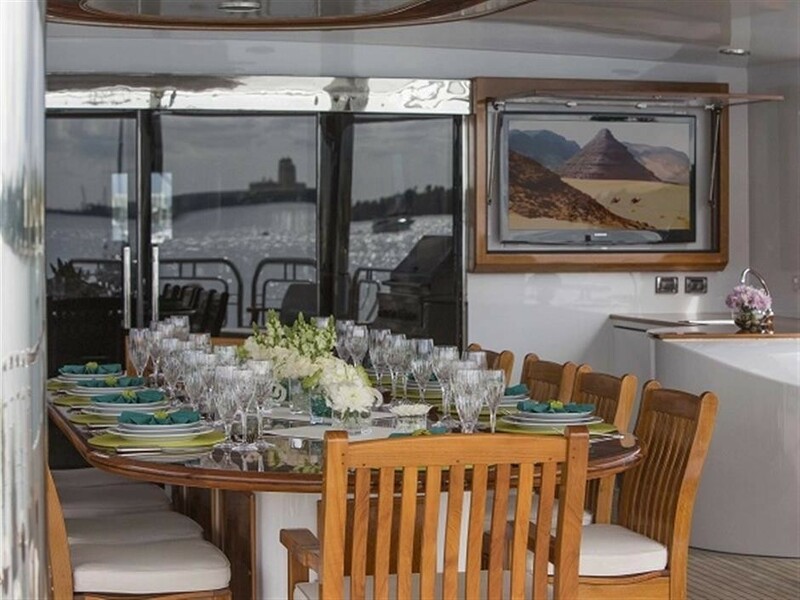 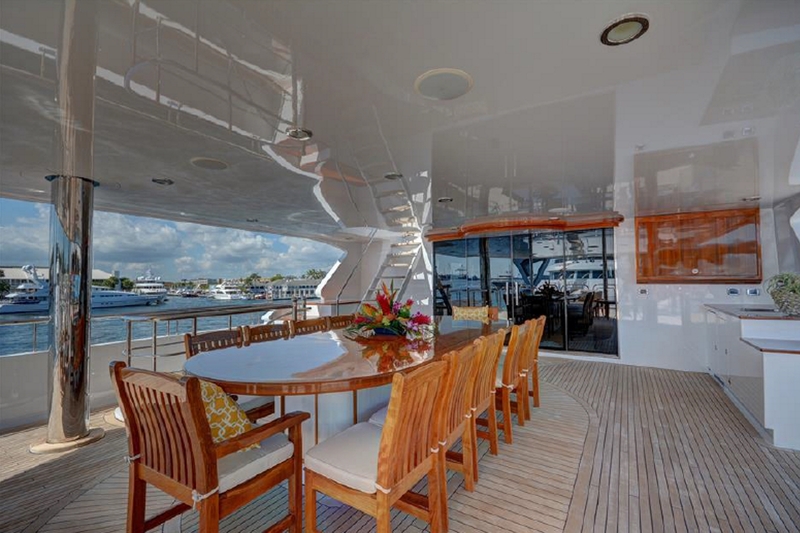 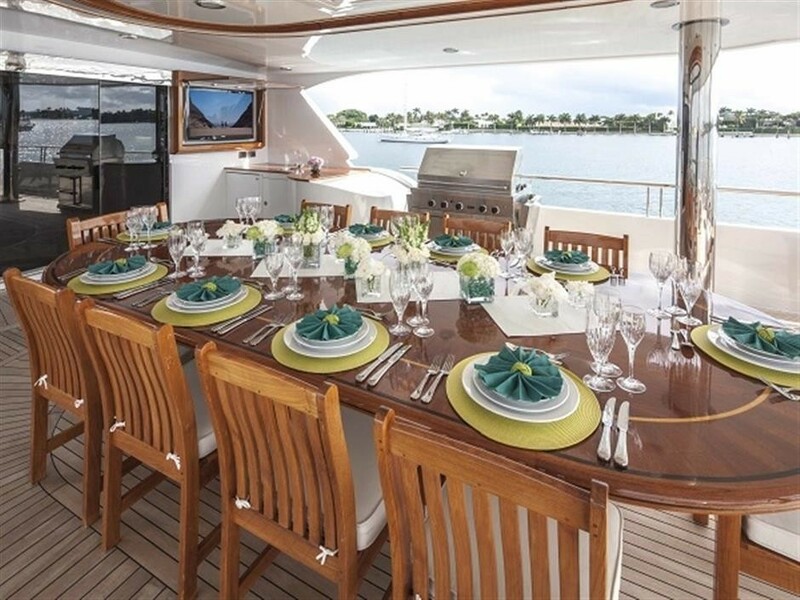 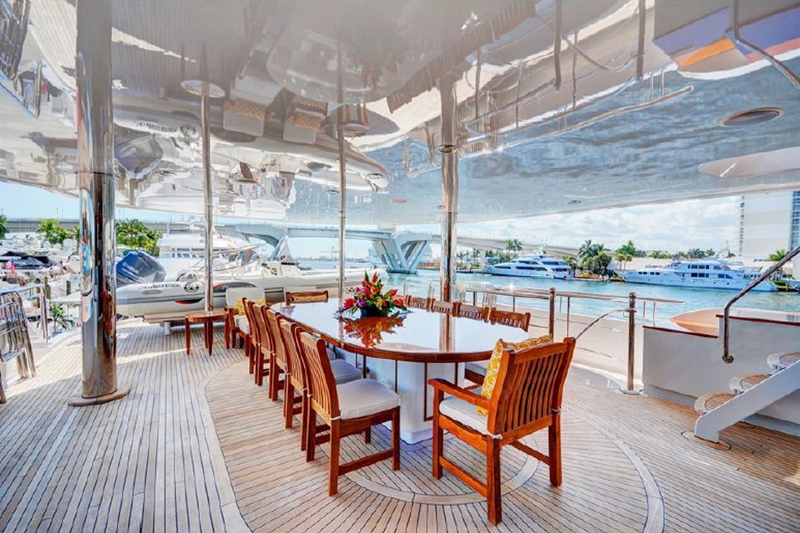 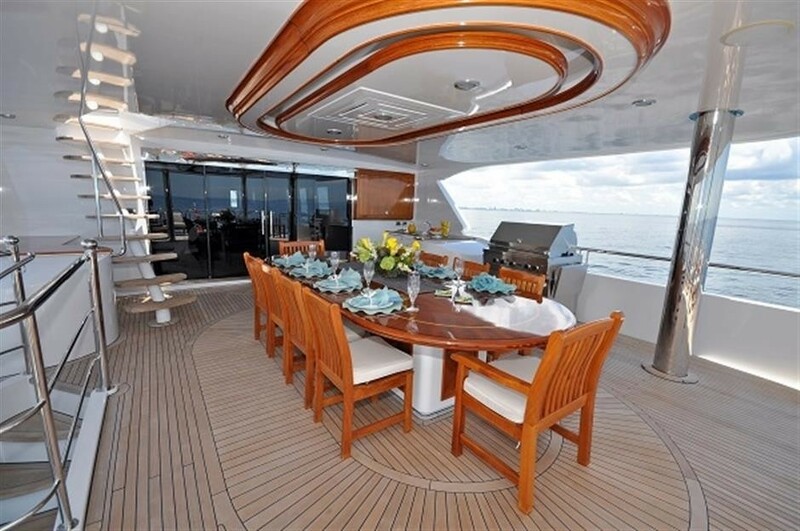 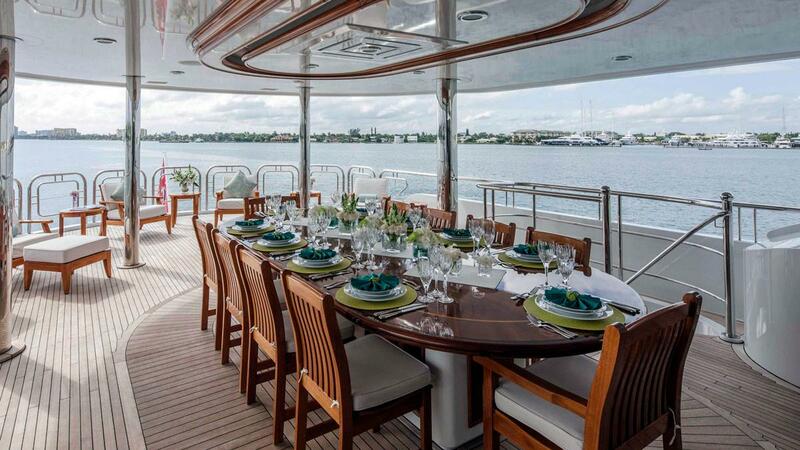 Wide sliding glass doors open on the spacious aft deck and alfresco dining table. 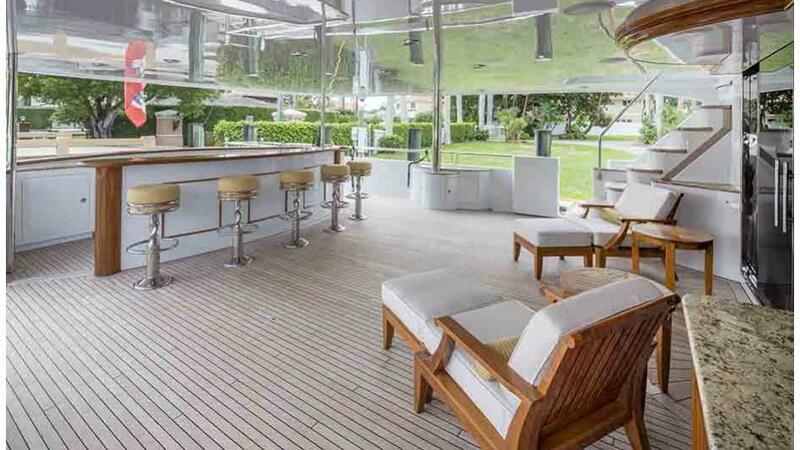 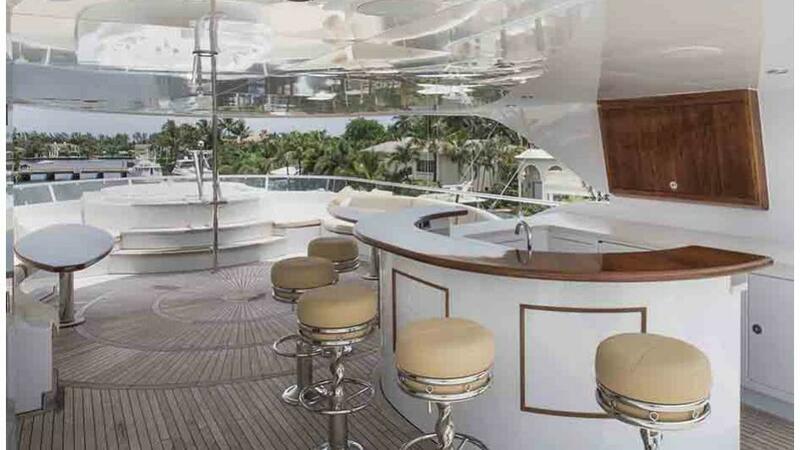 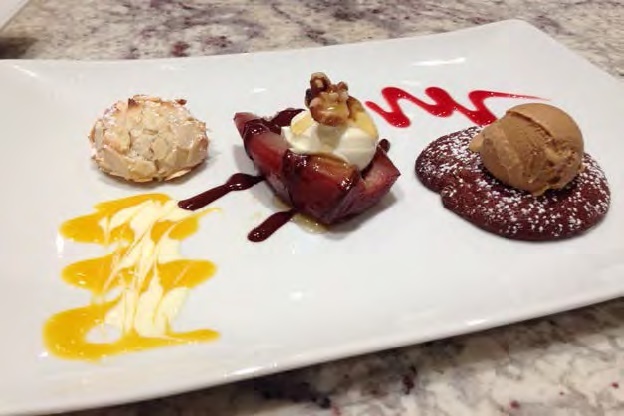 A full-service station makes the entire deck into the perfect entertaining venue. 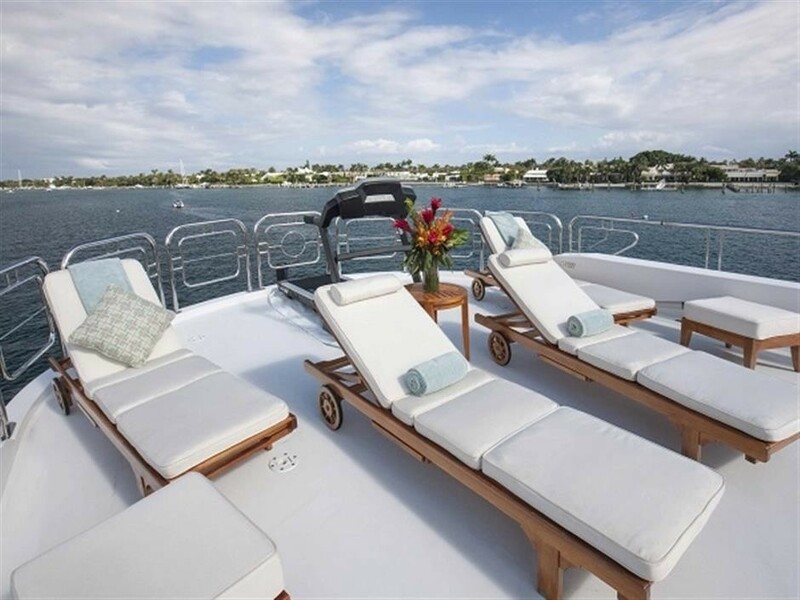 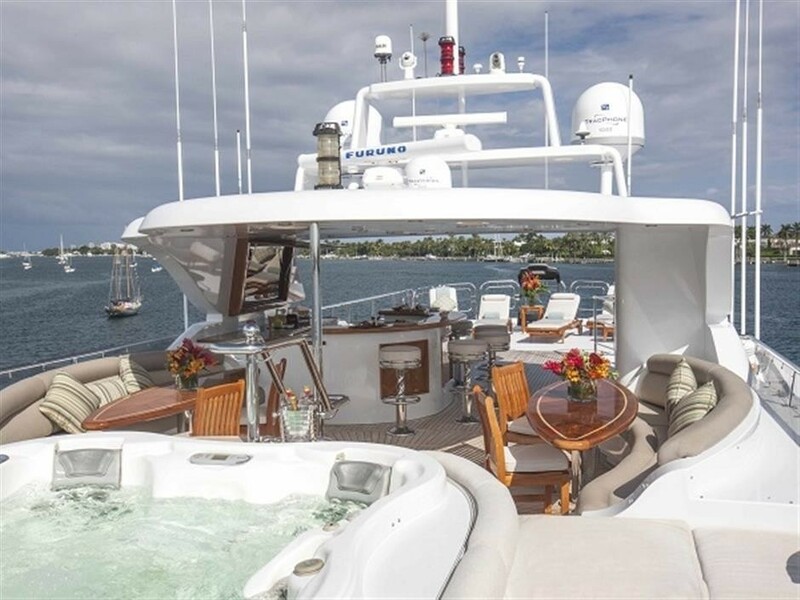 There is a third deck with a more casual ambiance and the sundeck boasts plenty of chaise lounges, large sunpad, alfresco dining options, complete wet bar, TV and deluxe Spa Pool tub. 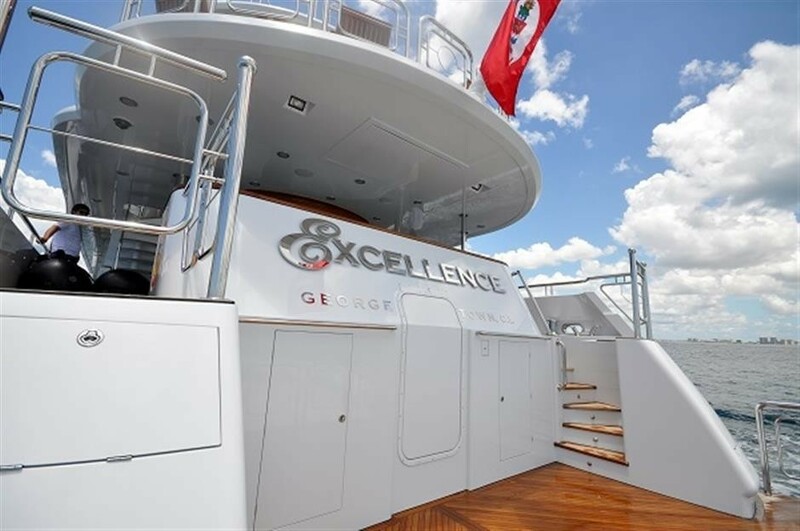 EXCELLENCE's stunning semi displacement hull has a beam of 8.5m (28ft) and a draft of just 2.1m (7ft), enabling her to venture to some shallower destinations. 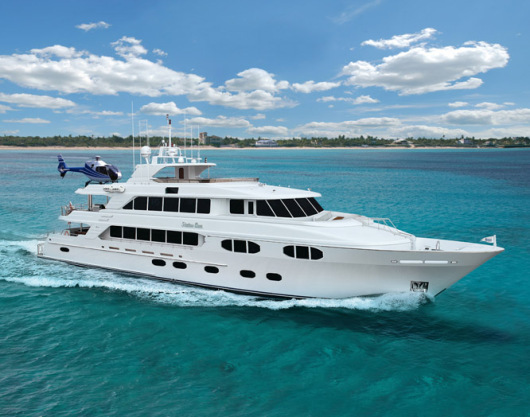 She is the ideal choice for large groups, families and events, thanks to her abundance of interior and exterior living options. 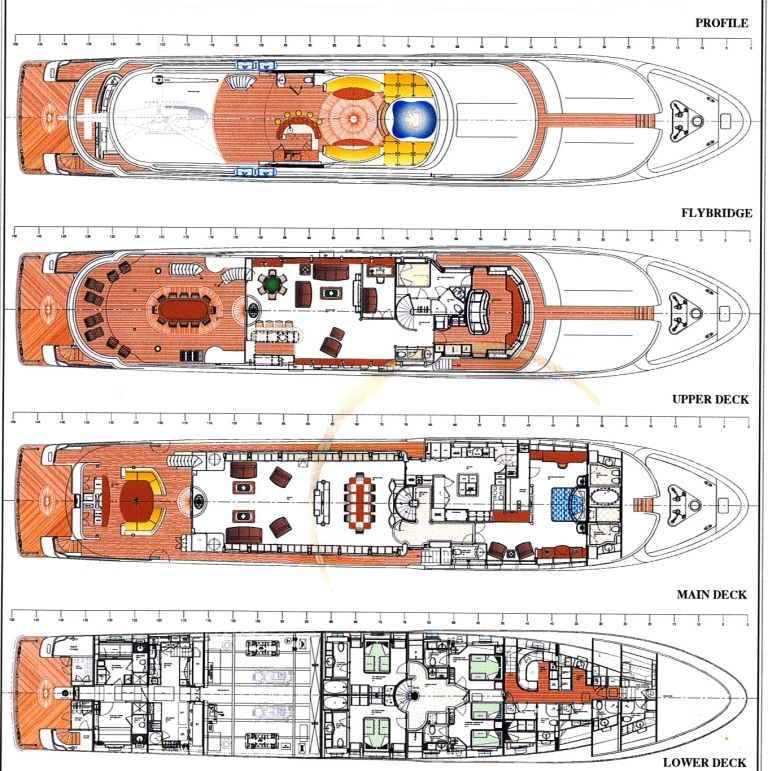 She is crewed by a professional crew of 8. 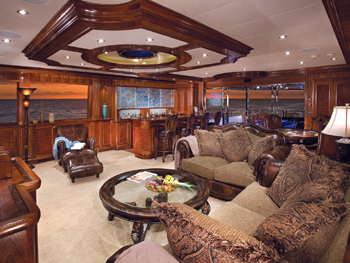 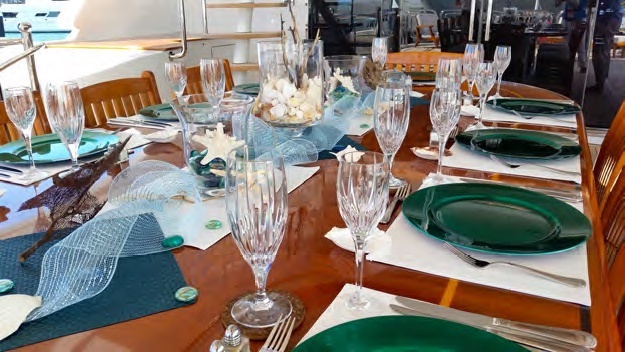 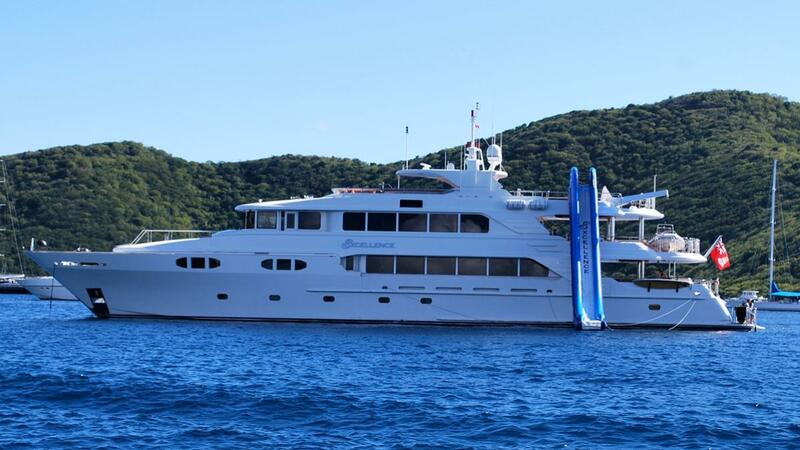 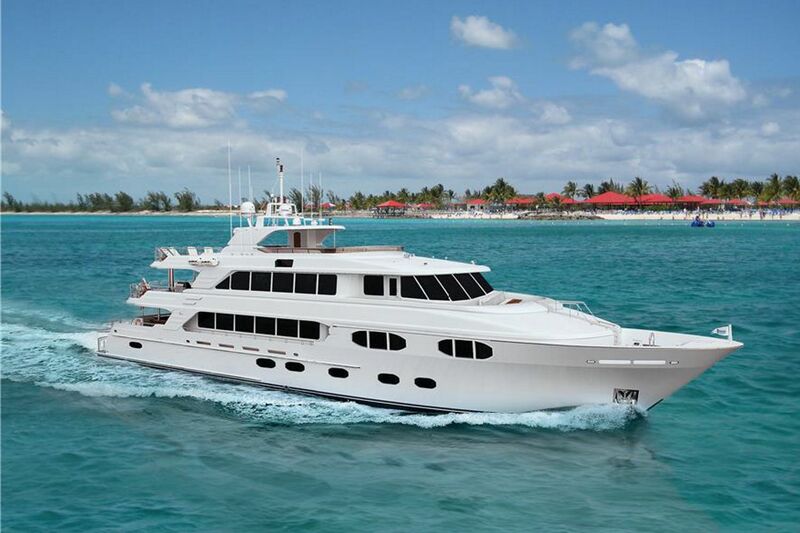 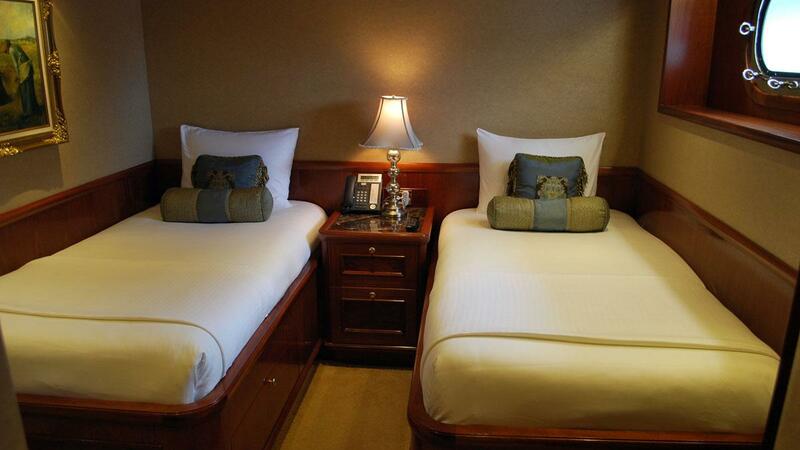 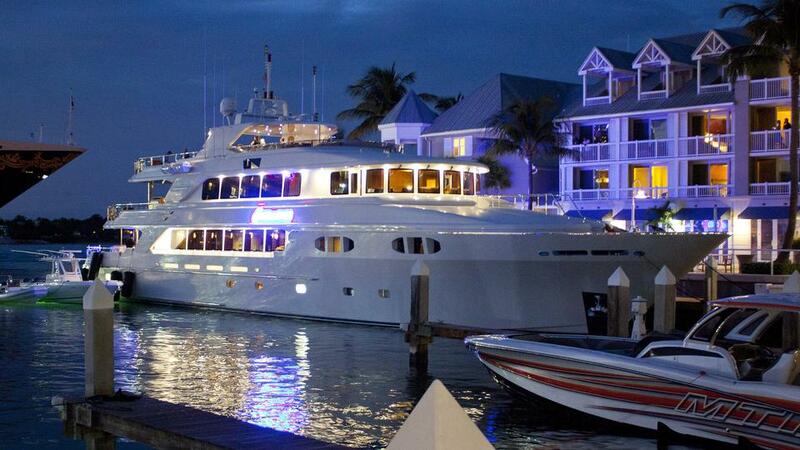 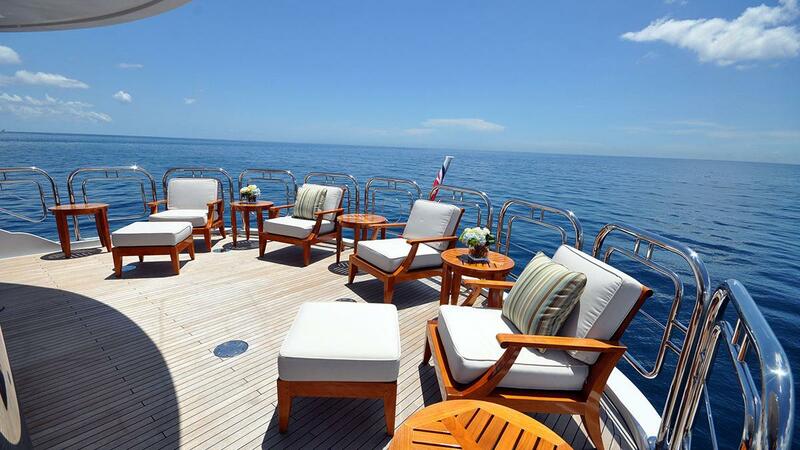 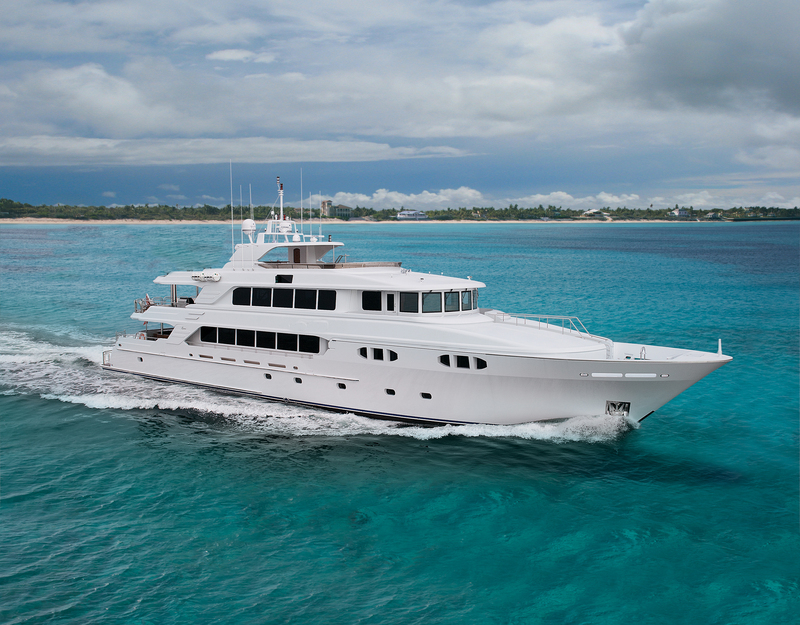 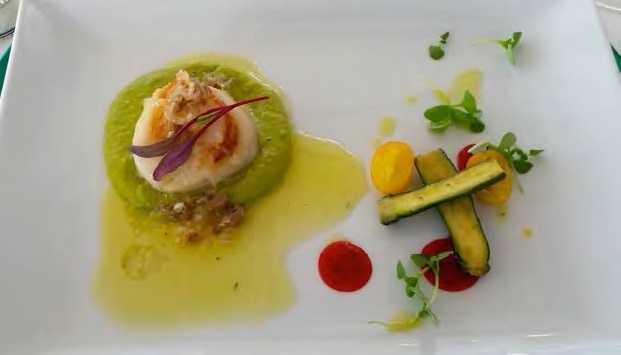 EXCELLENCE offers elegant accommodation for 12 charter guests. 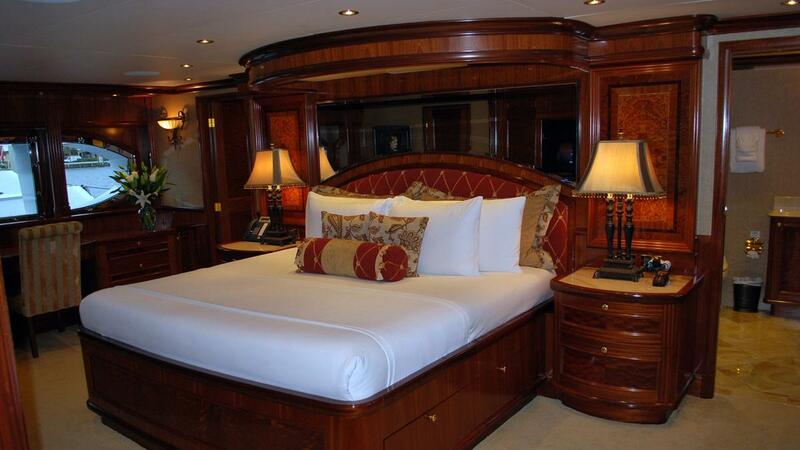 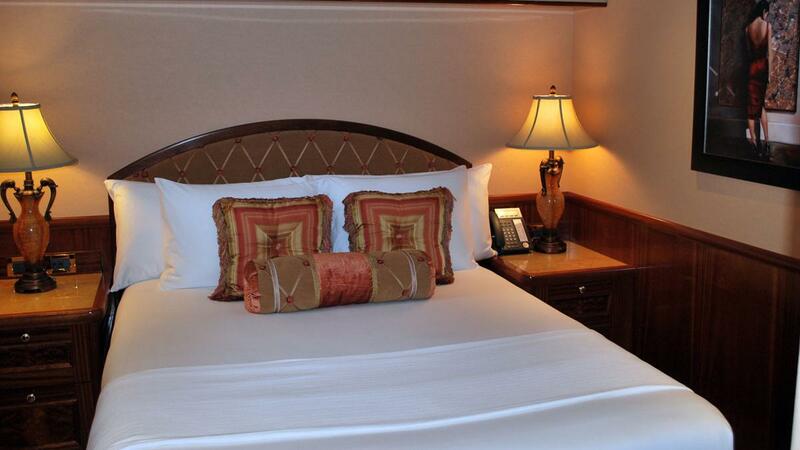 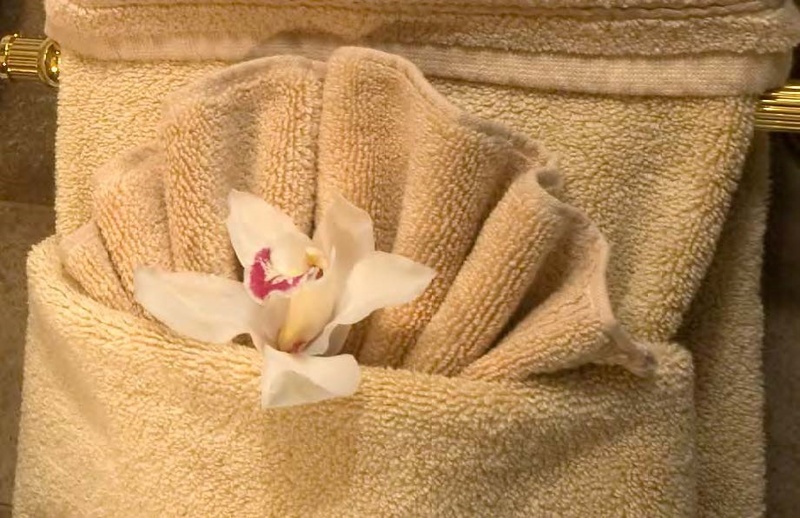 The master stateroom is on the main deck forward of the salon and dining with a king size center lined bed, private study, vanity and his and hers facilities fully equipped with multi-head shower, large Jacuzzi tub and 2 LCD TVs. 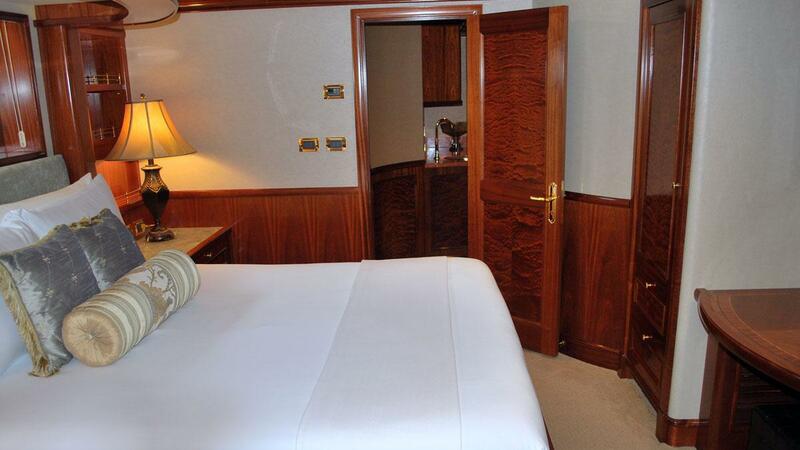 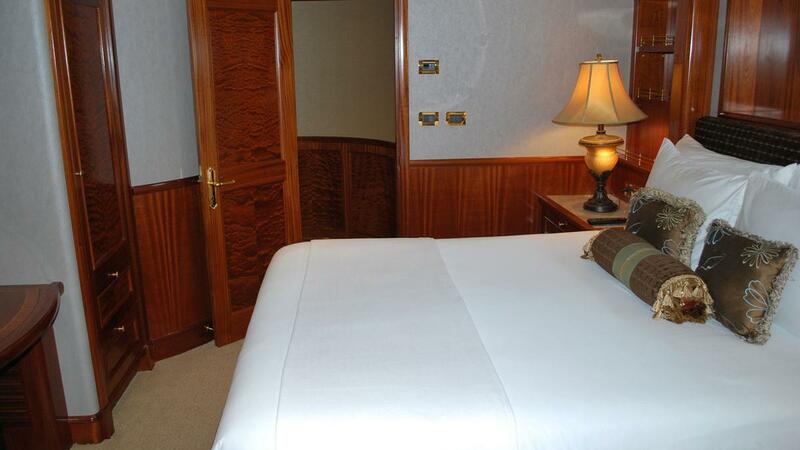 There is a VIP cabin on the bridge deck, plus four further cabins, 3 with queen size beds and 1 with side by side single beds, each with en-suite facilities. 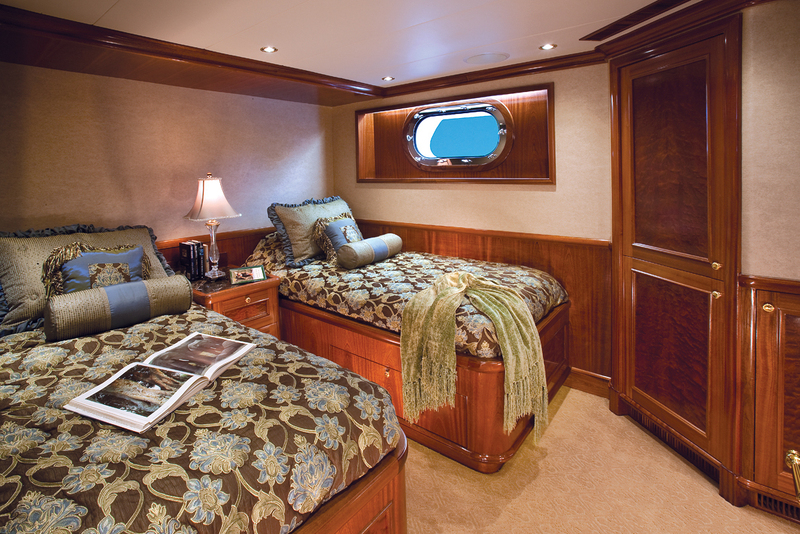 All 5 cabins are light and spacious with a neutral décor. 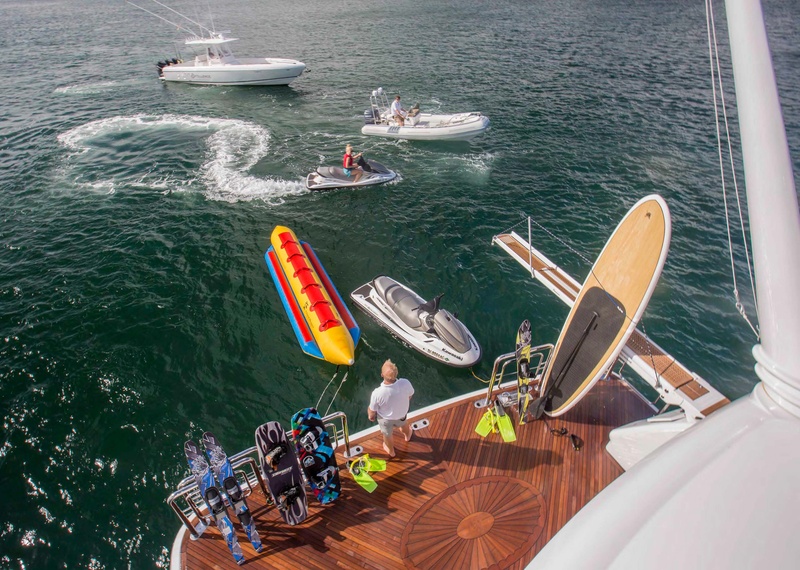 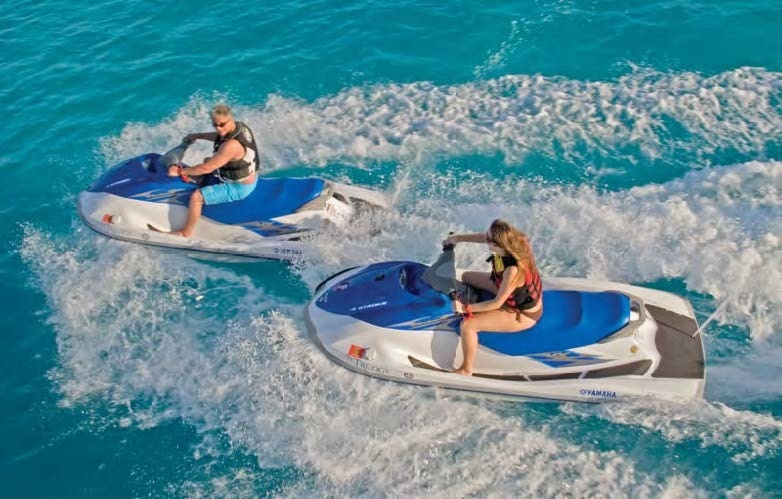 Toys include: Slide from top deck, Jet Lev, 30' towed Intrepid w/ twin 275 Mercury, 2 wave runners, 2 Paddleboards, 2 Inflatable seethrough, bottom kayaks, Snorkel gear, fishing gear, towed toys, Banana Boat, Treadmill, Exercise equipment, Beach set up, Tent, tables,chairs, Beach Lounge chairs, Volley ball set up, Communications include VSAT.